It has been a little quieter at Preston with Alan, Tim, Ade and Keith all absent for various reasons. 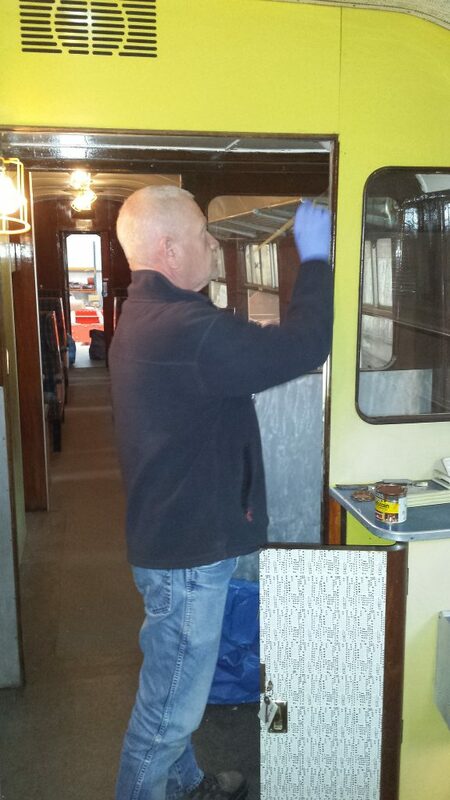 John Dixon has finished the door frame beadings on the RMB and has been installing new rubber sealing strips at the bottom of the door frames, which should reduce draughts within the coach. 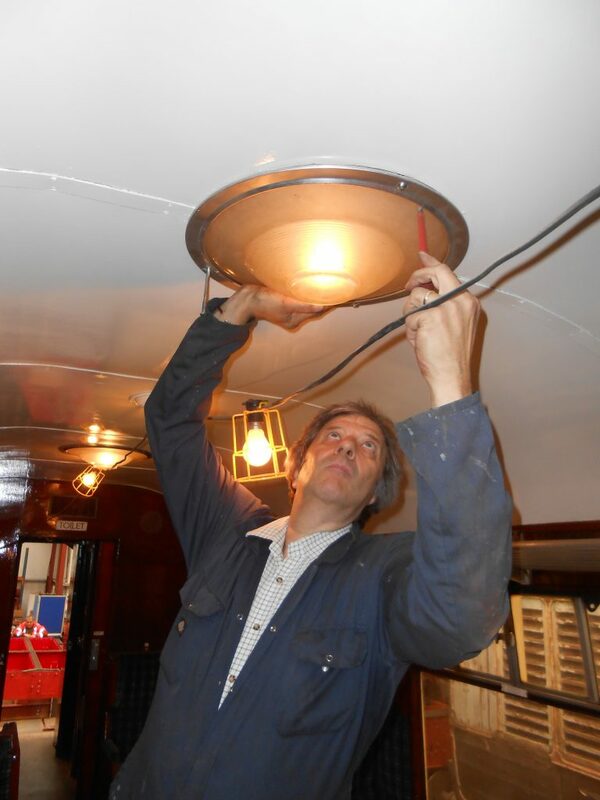 John Davis has been undertaking more cleaning within the coach, Mike has been picking out lettering on battery and gas boxes beneath the frames and Paul has been fettling the door locks on the cupboards. 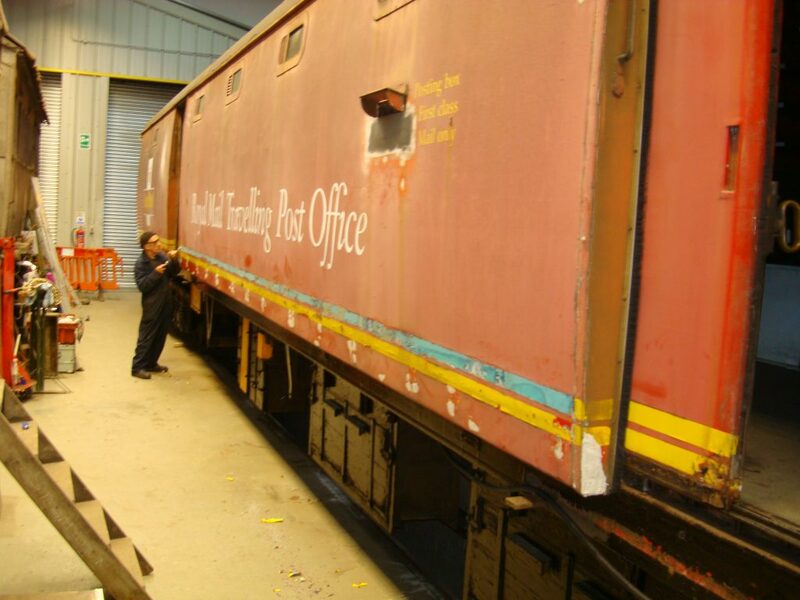 Howard and David have continued to remove the yellow stripes on the RSR’s TPO vehicle. Fred and Roger spent Friday on the ‘magic carpet’ cleaning and de-rusting the north side of its roof. Wednesday’s operations were somewhat disrupted by a fire warden’s course and those present were able to practice their fire-fighting skills with a fire extinguisher. 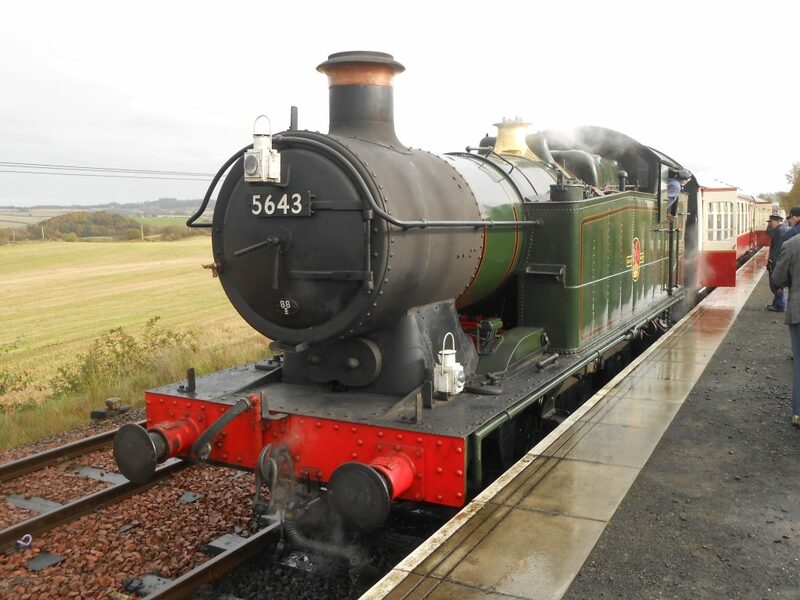 The main event of the week has been in Scotland at the Bo’ness & Kinneil Railway where 5643 was used for an all day photo charter on Friday followed by a Fish & Chip Special that evening, which had been sold out. It then went on to star at the B&KR’s Steam Gala where it performed on Saturday and Sunday alongside the home loco fleet. There is a photo here from the B&KR’s Facebook site showing 5643 approaching Birkhill with a service train the previous weekend. 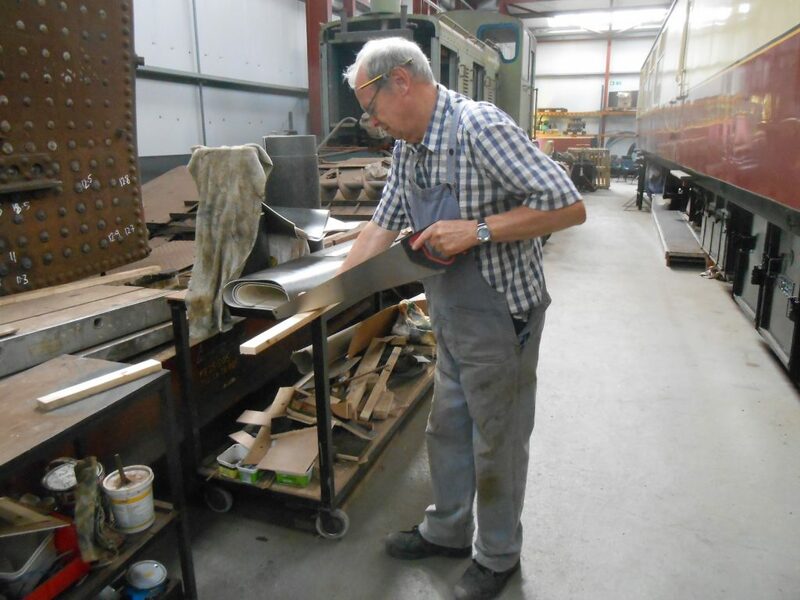 Alan has been working all hours to brief crews and to assist in the preparation of the loco and Alison has made a very useful contribution to the Trust’s coffers through the operation of the sales stand in the buffet car. Tim visited on Saturday to be followed by Keith on Sunday. Everyone at the B&KR appeared to be impressed by 5643’s performance and seemed to enjoy having its presence there over the two weekends. Looking forward, Live Steam are performing at the Engine Inn at Cark next Saturday evening and there will of course be spooky trains at the RSR next weekend. Also, a Hi-ab lorry has been booked to move the mess room at Preston on Saturday. 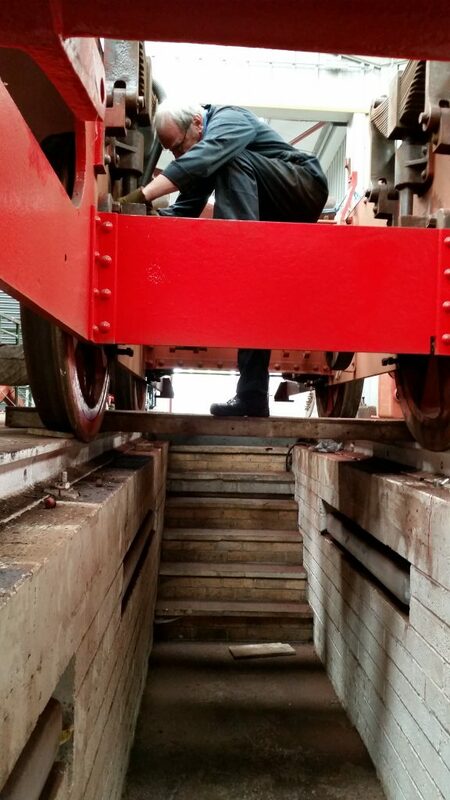 The following Tuesday will see a working party at Locomotion, Shildon, as members assemble for a dirty day out as they prepare FR 20 for its 14 month boiler examination. It has been another full week of activity to keep us busy. The Preston Branch meeting on Tuesday turned out to be an unfortunate catalogue of cancellations. Ade’s train from the Pleasure Beach was cancelled so he had to find an alternative means of getting to the meeting. Then it was found that the landlord of The Ale Emporium had changed and the usual room had been hired out to a ladies’ dance group(!). The evening then became an opportunity for members to have a beer or two whilst having an enjoyable discussion. Alan’s new ‘phone became the source of the evening’s photos, the main feature being the X-Ray of Alison’s knee (see last week’s blog) and bruised legs! Others continued to chat, with a break out party to the Vic, whilst Tim had to hurry home after discovering that the later Furness Line train had been cancelled as well…! There was a good turn out at Preston on Wednesday. 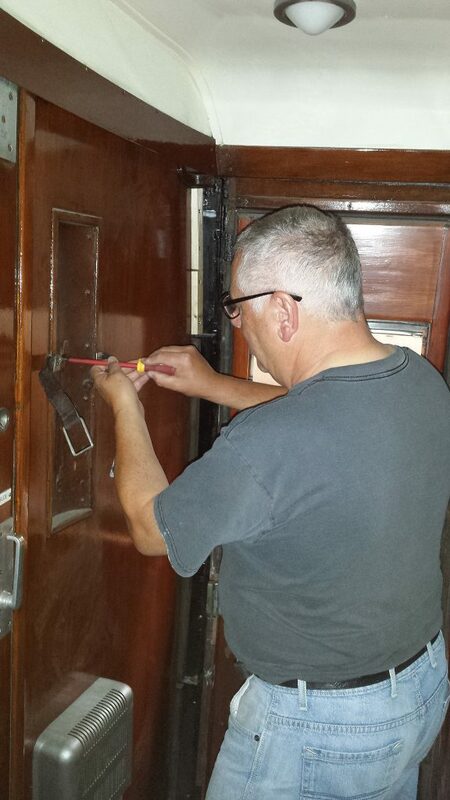 John Dixon continued with his woodwork on the RMB door beading, whilst Mike and John Davis cleaned the servery area and re-fitted the water boiler. Tim spent the day cleaning the south side of the TPO vehicle roof, which was finished on Friday with the assistance of Fred. Paul has been vacuuming the seats, which now look much better after his attention. Howard continued the challenge of removing the yellow tape from the sides of the TPO and on Saturday Howard and David between them managed to finish removing both yellow stripes from the north side of the TPO – as Howard said, parking restrictions have now been removed! 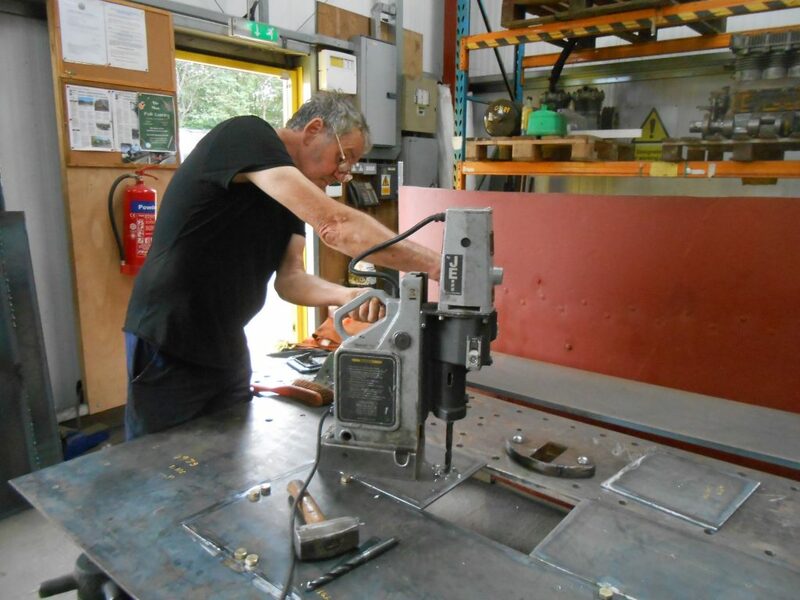 Ade was busy re-assembling the reverser gear on Caliban after some deliberation with Alan as to how it fitted together. Meanwhile Sam spent a considerable time cleaning up the threads of the studs for Caliban‘s valve covers. 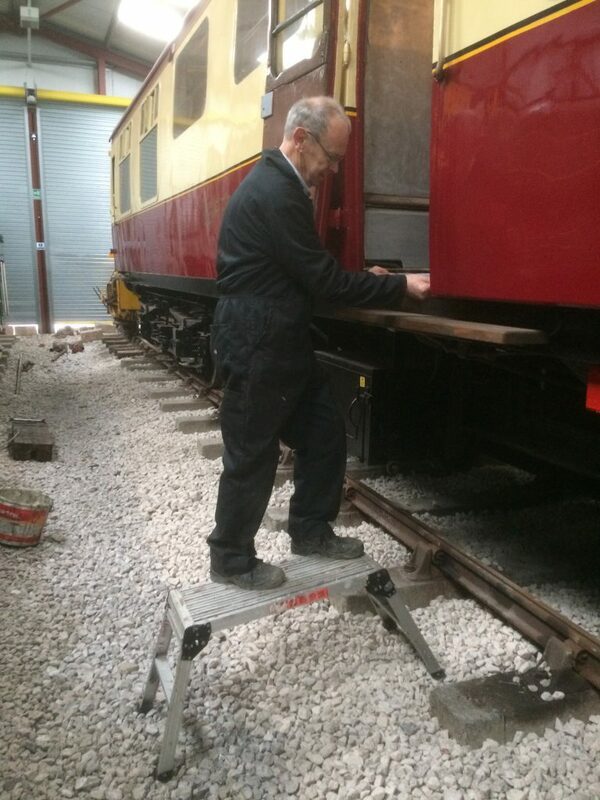 John H is seen here giving Keith a hand, who was removing old rivets from the Hall’s tender frames. 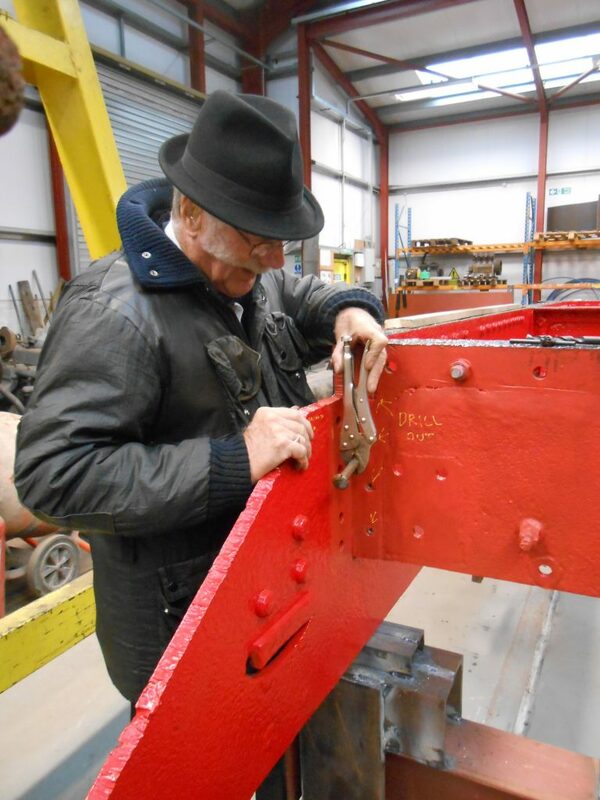 We had to remind John H that he had been caught red handed working on a GWR loco! 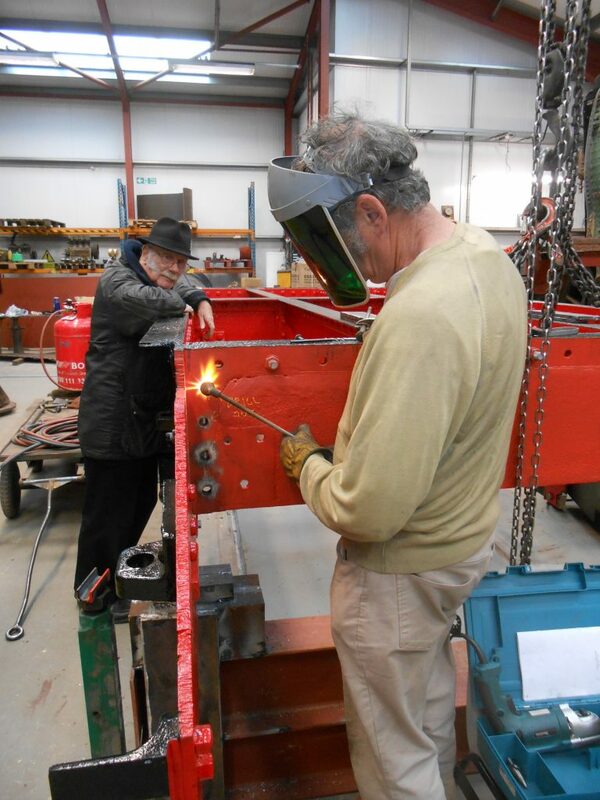 John Stewart came in on Saturday to do some welding on the frames, seen here, and the buffer beam was then temporarily fitted on to the frames. As you will recall, 5643 was due to be transported up to the Bo’ness & Kinneil Railway on Monday, but when Alan and Alison arrived there on Thursday afternoon it was nowhere to be seen. It finally arrived on Thursday evening to be offloaded on Friday morning. The causes of the delay were driver sickness, a fault with the trailer, flooding on the A65 on Wednesday and a crane fire near Kendal on the M6 on Thursday morning, which caused the northbound carriageway to the closed. However, having said all that, Alan reports that 5643 ran well on Saturday and Sunday on the B&KR’s service train with barely a slip on that bank past Birkhill. 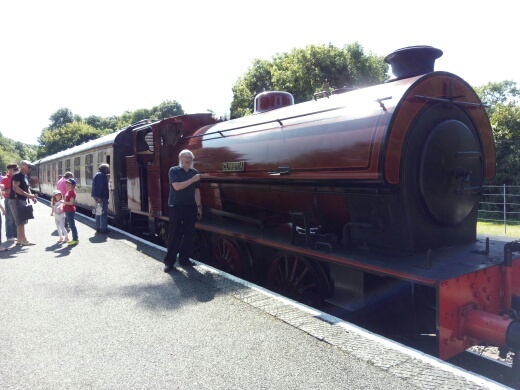 It seems that some of the people attending the photo charter next Friday were trying out South Wales headcode targets (eg Abercynon to Merthyr Tydfil) on the loco to make sure that they would fit. 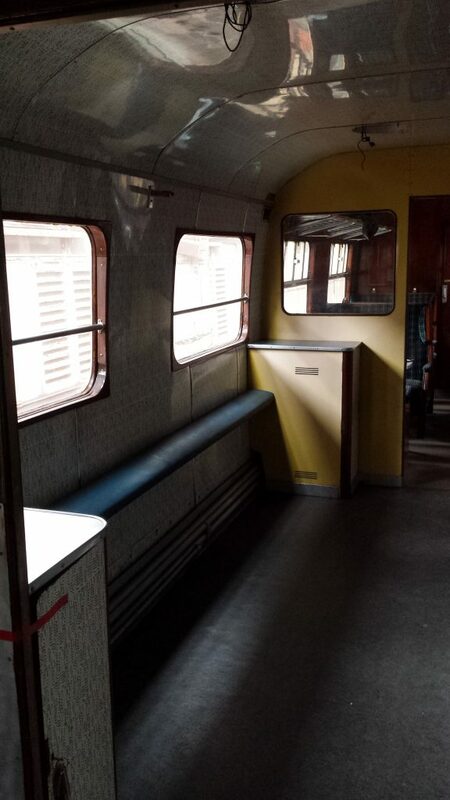 Alison set up a souvenir sales stand in the buffet car as well as taking some photos for us to enjoy. 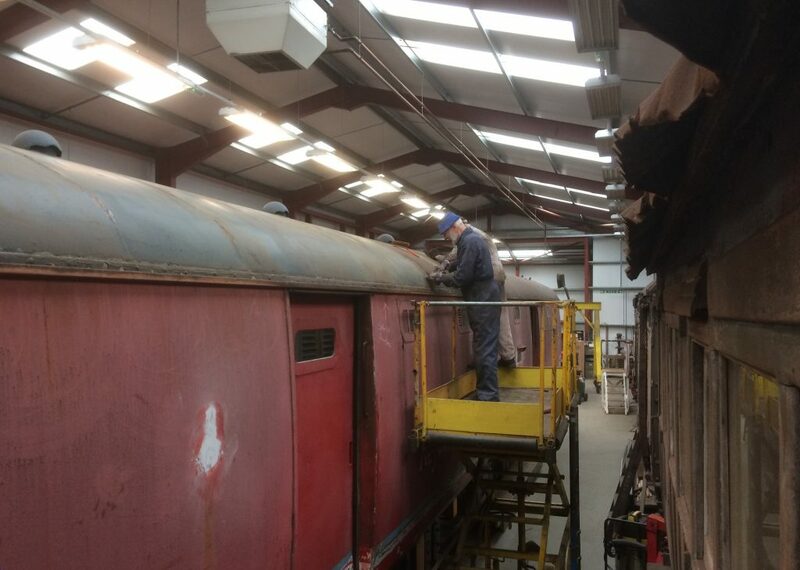 Moving on, no sooner have we finished completing the 14 month boiler strip down and examination on 5643 than it is the turn of Furness Railway No. 20 to undergo the same process. 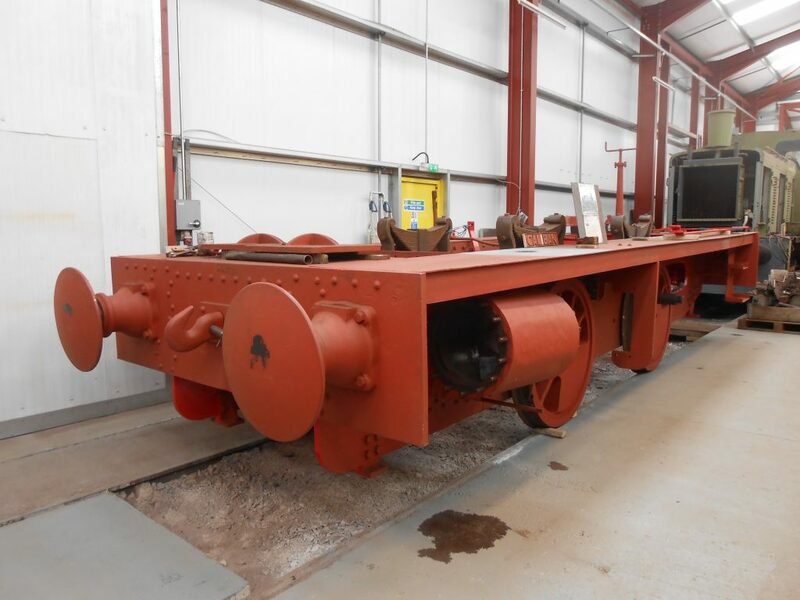 A working party at Locomotion, Shildon, has been scheduled for Tuesday, 31st October with a cold examination by the boiler surveyor booked for Friday, 3rd November. A formal steam test has been provisionally booked for Friday, 10th November, in advance of two further booked steamings on the 11th and 12th in connection with a Lego event. 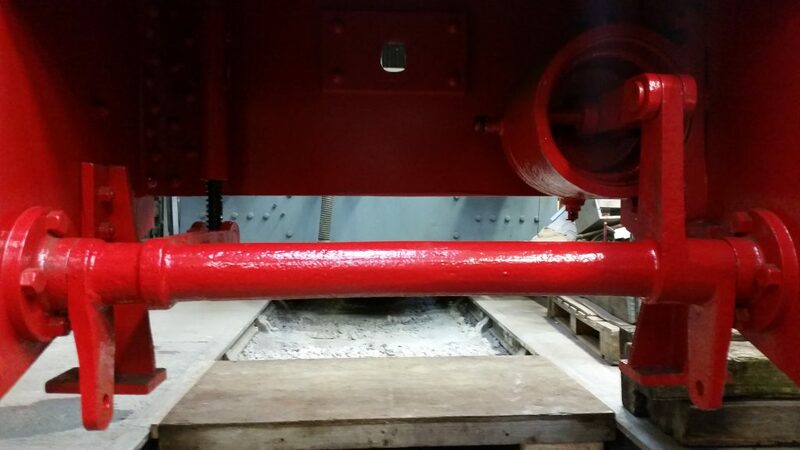 The principal task last week was the completion of the work required to put 5643 into an operable condition after its firebox work and subsequent cold examination by the boiler surveyor. A working party took place at Embsay on Wednesday with Keith, John Dixon and John Davis travelling across with the newly machined blower ring, refractory concrete and formers for the brick arch together with a variety of tools. The new and old blower rings are pictured above. Alan had also travelled down and the gang were successful in installing the new blower ring before 5643 was drawn out of the shed to allow Alan to put in a warming fire. Alan and John Dixon returned to Embsay on Thursday to fire up the loco for its scheduled steam test at 14.30 which it duly passed. There was another gathering at Embsay when the new brick arch was cast and Fred and Keith cleaned up the exterior of 5643, a task which Keith continued on Sunday. 5643 is due to be transported to Bo’ness today (Monday) and Alan is planning to drive up to Scotland on Thursday with a test steaming at Bo’ness planned for Friday. 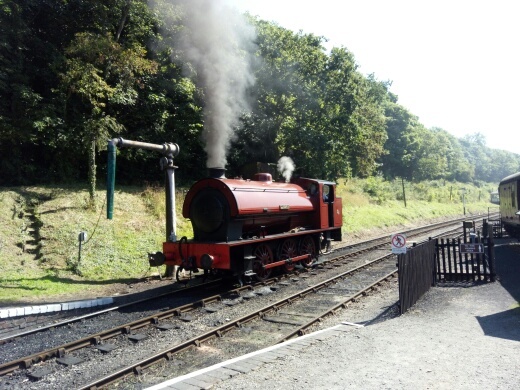 The loco is then planned to be in normal service on Saturday and Sunday, then the following Friday (Photo Charter and evening Fish & Chip Special), and Saturday and Sunday for the Gala. 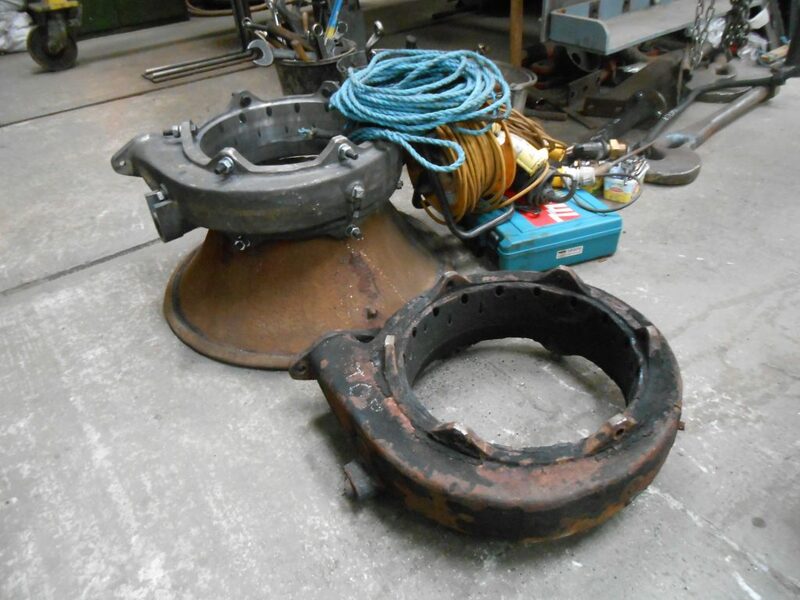 The process of getting 5643 through its annual boiler survey and steam test, together with the associated works, in time for its trip to Scotland, devoured much time and effort from the Trust’s volunteers and also that of Steve Shearing who machined the new blower ring. Hearty thanks go to all those involved and also to our boiler surveyor for arranging his diary to fit into our schedule. 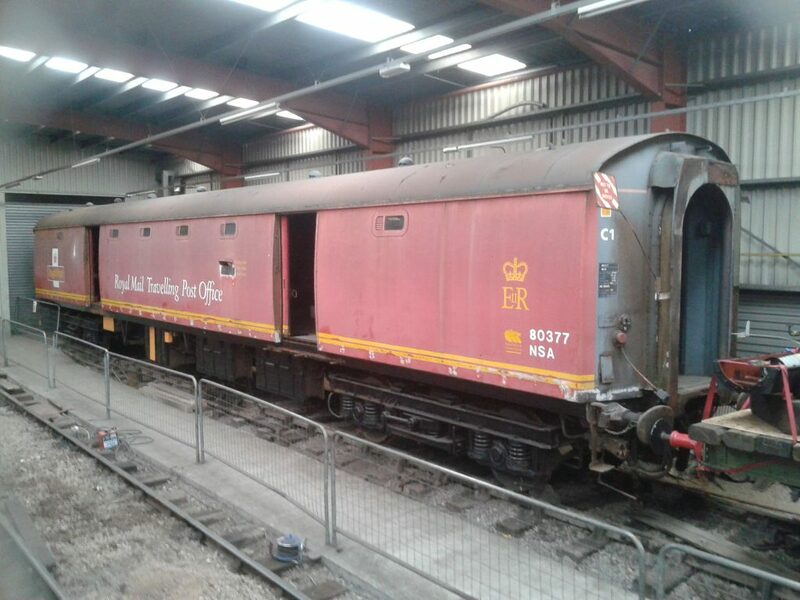 As promised in last week’s blog, the RMB has moved out of the heated part of the shed with its place being taken by the RSR’s Post Office Sorting Vehicle No. 80377. Tim and David took plenty of measurements and photographs before the graphics are removed to allow painting to take place. 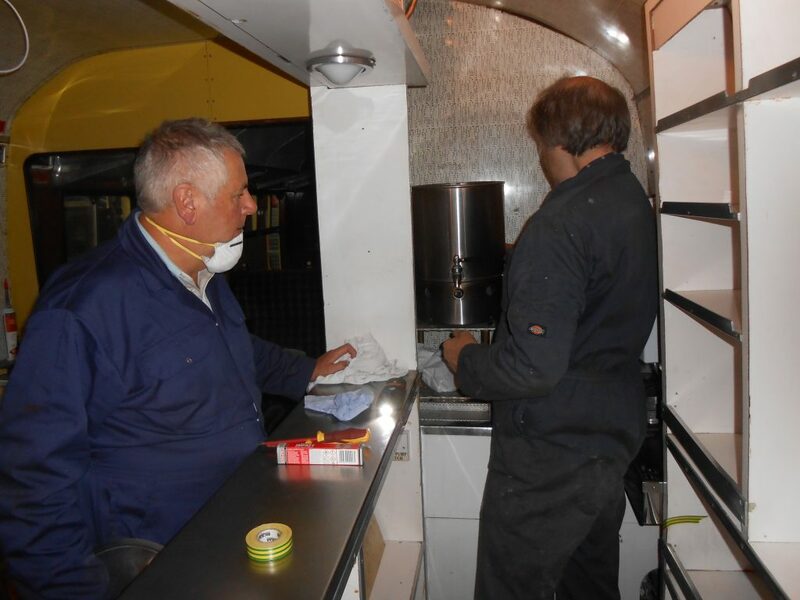 Tim then started to remove loose paintwork on the roof whilst, on Saturday, David and Howard commenced the task of removing the two 2″ wide yellow lines which had been taped on to the bodywork. It had been thought that a heat gun would assist in the removal of the tape, but the fact that there are two layers of tape defeated these efforts and so it was necessary to resort to scrapers to make progress. 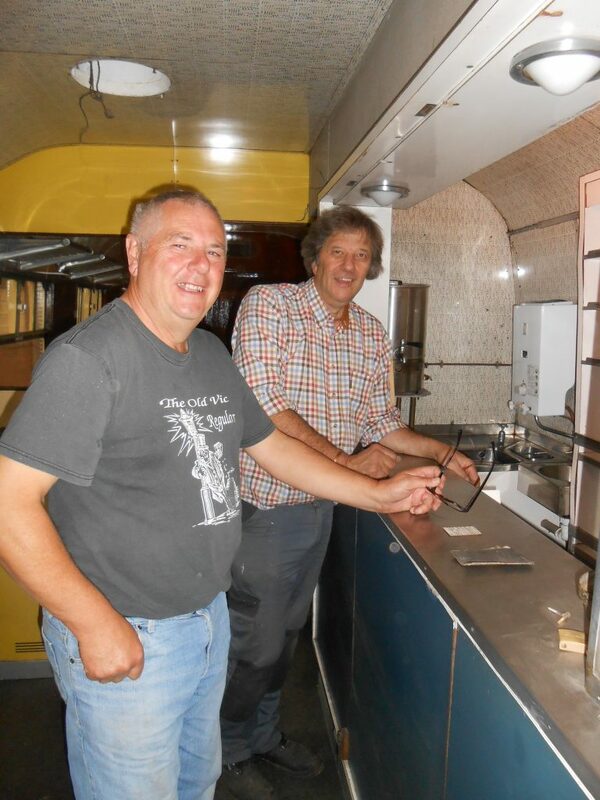 With Mike away it was left to Paul and John Davis to continue the remaining jobs on the RMB on Friday including a clean up of the old water boiler and more shining of the brass work. Adrian made further progress with painting up Caliban‘s components, seen here with one of the pins. There is also a view of a sparkling brake beam. Alan and Alison were at Locomotion, Shildon over the weekend for two more steamings of FR 20. Unfortunately, Alison’s knee, which she injured in a fall at Preston last weekend whilst preparing for the Folk Evening, flared up on the Saturday resulting in an unexpected trip to both Bishop Auckland and Darlington hospitals before doctors were able to declare that the problem was severe bruising, which would require Alison to rest. And there lies the problem, for it is a well known fact that Alison doesn’t do ‘resting’! We all wish her well for a speedy recovery. FR 20’s boiler certificate will expire before its next planned steamings on the 11th and 12th November, so it will be necessary to prepare the locomotive for a cold examination by the boiler surveyor. It is provisionally planned that a working party will visit Shildon on Tuesday, 31st October, depending on the availability of our usual loyal volunteers. Finally, it is that time of year again when we start the winter season of Preston branch meetings. The first will take place tomorrow, Tuesday 10th October, at 8 pm at The Ale Emporium, Fylde Road, Preston when, no doubt, more steamy videos will be shown. 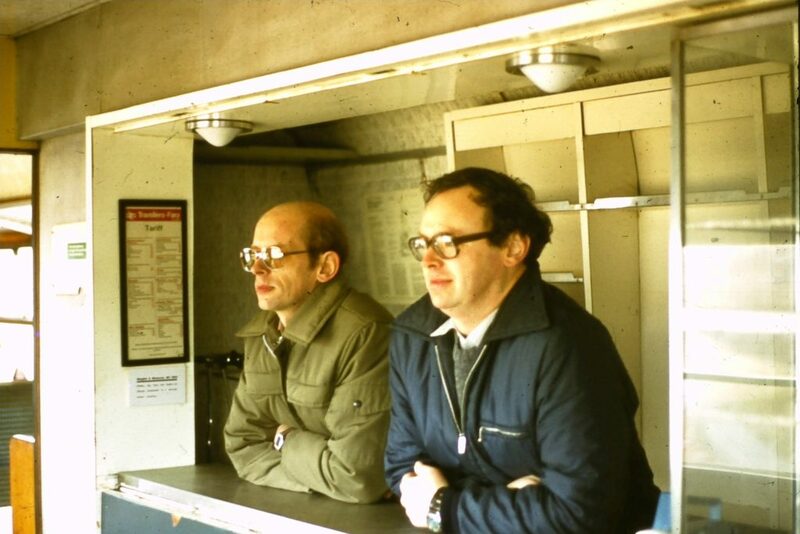 With the RMB almost ready to be passed over for operation on the Ribble Steam Railway, we leave you with a ‘blast from the past’ photo of Carriage and Wagon stalwarts David Rimmer and John Dixon behind the counter on a visit to Cowlairs, Glasgow, to inspect the new acquisition on Saturday, 15th January 1982. Can it really be 35 years since it was purchased?! Yet another busy week has passed by – well we don’t really want too many quiet times, but the occasional rest would be useful…! 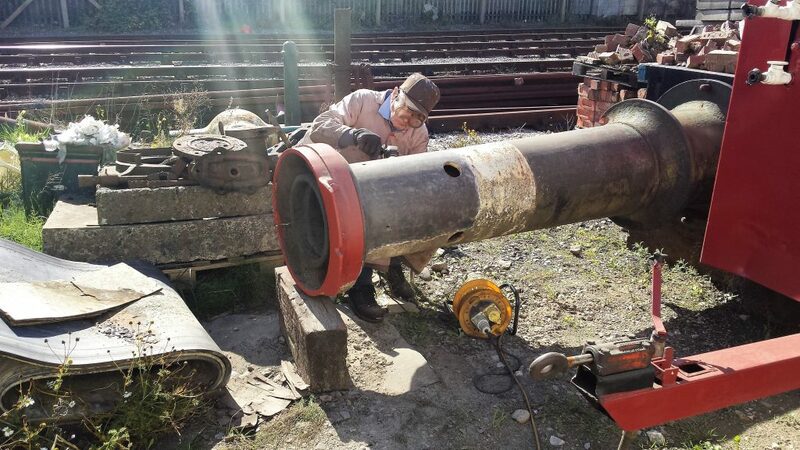 5643 passed its cold inspection with the boiler surveyor on Thursday, and Keith and George were planning to head over to Embsay yesterday (Sunday) to refit the safety valves, washout plugs and mudhole doors. 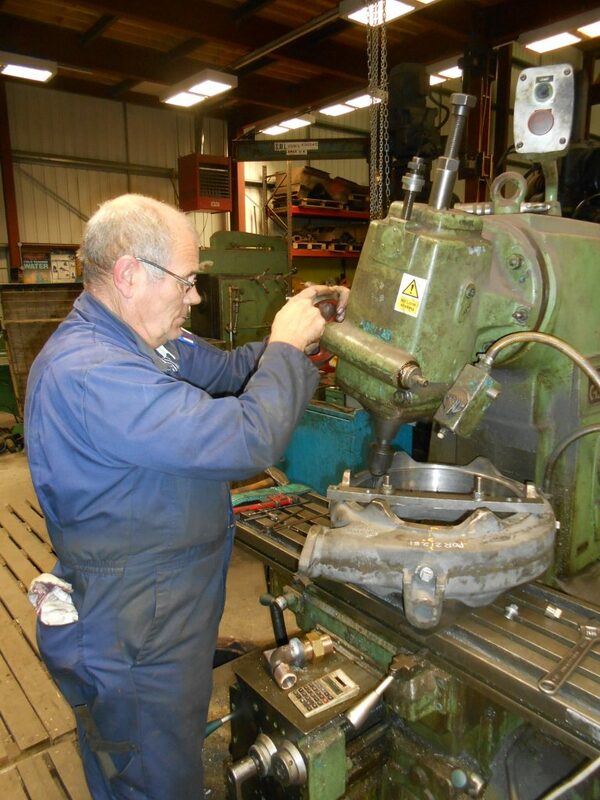 Meanwhile, Steve Shearing has been spending many hours in the workshop at Preston machining the new blower ring and elbow in readiness for fitting before the steam test. This has been quite a challenge to accomplish in time and it is hoped that it will be ready to fit on Wednesday before the fire is lit! 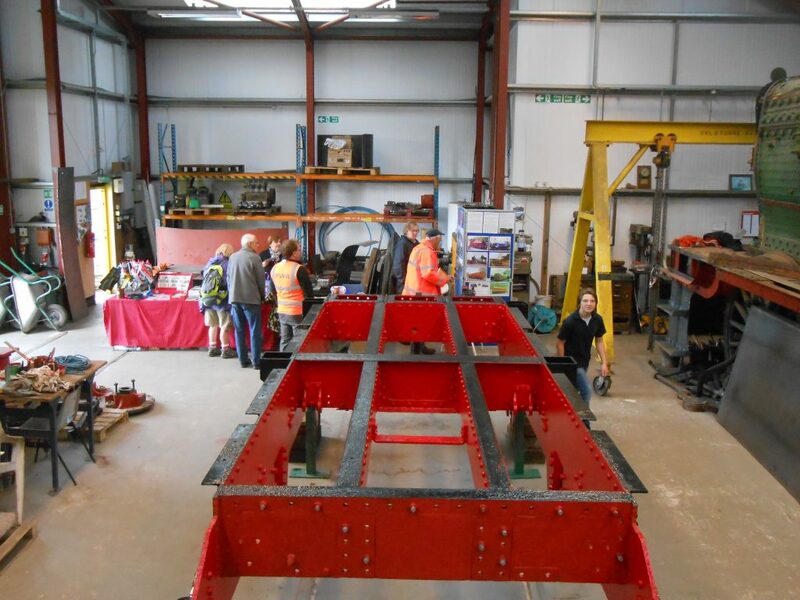 A steam test has been scheduled for Thursday afternoon after which a new brick arch will have to be fitted before the loco leaves Embsay on Monday morning for its visit to the Bo’ness & Kinneil Railway over the following two weekends. The RMB has been spending its last week in the heated part of the shed as a move into the unheated part has been arranged for today, Monday. Its place will be taken by the RSR’s Post Office Sorting vehicle No. 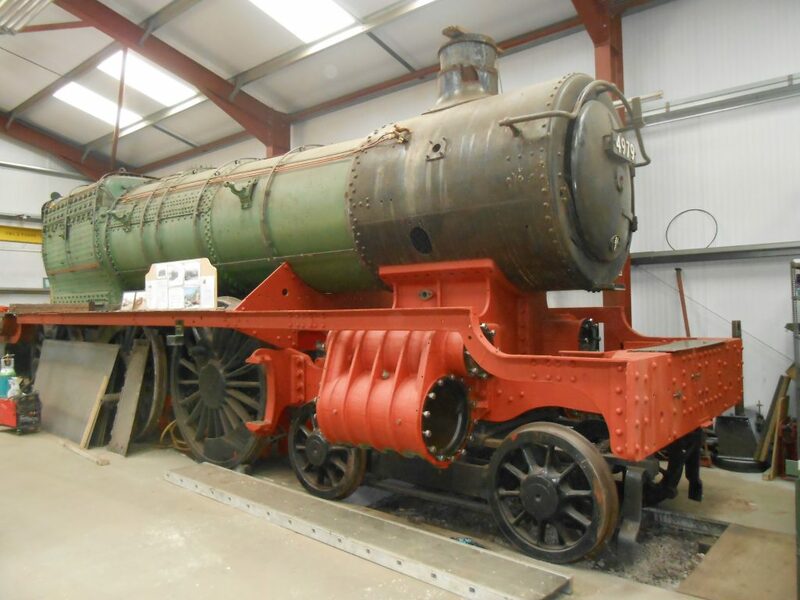 80377 which was recently purchased from the Kirklees Light Railway and is planned to be used as an exhibit in the museum. Built in 1972, the vehicle was withdrawn from service in 2004. Whilst, on the surface, it does not appear to be in too bad a condition, there will be plenty of tidying up to do on the bodywork before it can be painted. 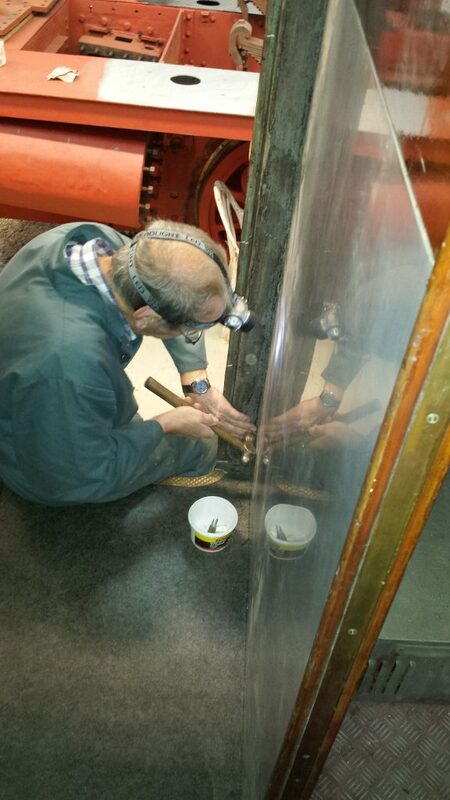 The various snagging jobs on the RMB were the subject of further work this week, and here we have to confess that a previous blog report that John Dixon had nearly finished replacing the panelling and beading around the doors was proven to be incorrect. John was keen to point out that such jobs take rather longer than people think and the blog team profusely apologises for belittling the task! A shore electrical supply was connected to the RMB so that the lights could be tested. Although many of them were not working initially, this was mainly because of dirty contacts. 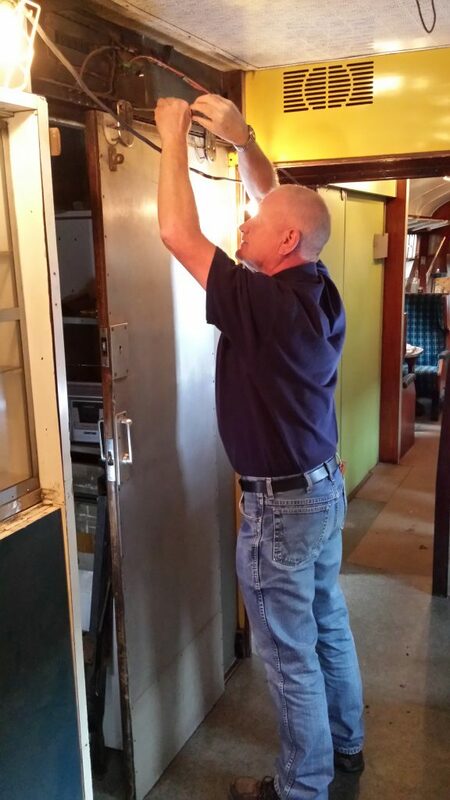 By the time that Mike Rigg had finished his work only one light bulb actually had to be changed. John Davis (seen here) and Paul carried on the other jobs inside the RMB including polishing the brasswork, which had obviously not seen a cleaning rag for many a year. 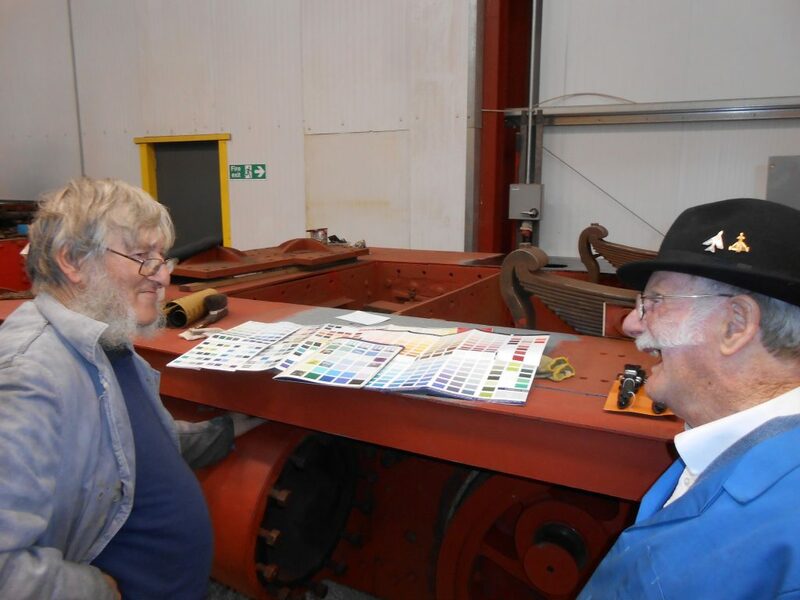 Adrian continued his work with a paintbrush on Caliban, giving a coat of black to the reverser quadrant whilst John H and Alan attended to other important jobs such as making a decision on the main colour scheme for the loco. At Adrian’s request Tim had brought in a pile of colour charts as Ade has hopes of painting the wheels in the not too distant future. Having brought the number of shades of blue down to a choice of three, Alan and John finally opted to be contrary by choosing ‘Pacific Blue’ for a 0-4-0 saddle tank loco! 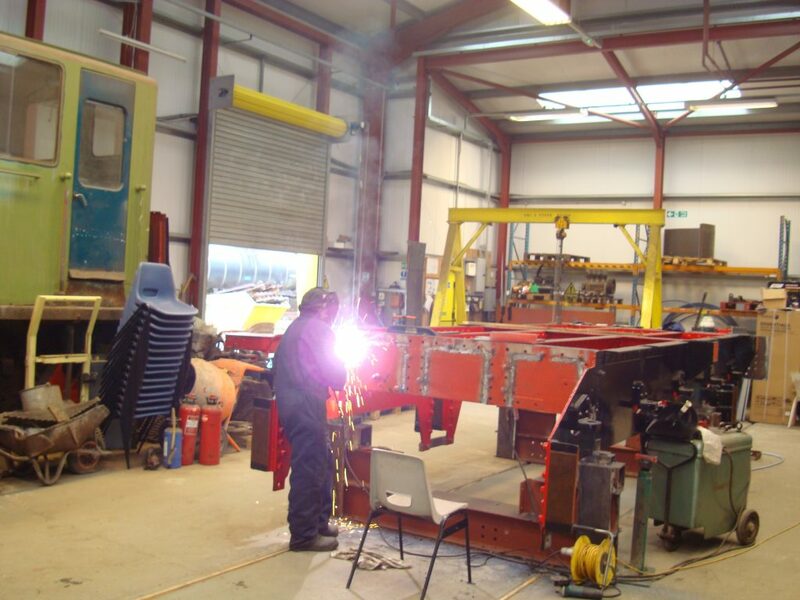 Wootton Hall‘s tender frames are now perched on a custom built steel stand constructed by Keith from some scrap RSJs which had been acquired. Roger and Fred turned up very late on Friday having been stuck on the M6 for a couple of hours north of Preston. 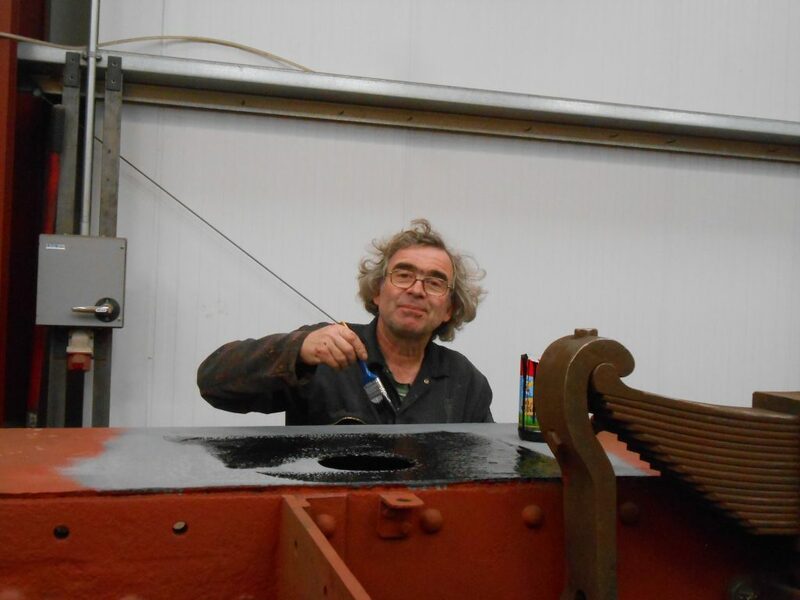 Roger put a coat of grey undercoat on Wootton Hall‘s brake beams whilst Fred went cleaning up the former Foxfield water column. The RSR’s Autumn Diesel Gala was successful and was augmented by the addition of a visiting DRS Class 37, which came down from Kingmoor at Carlisle. There was also some evening running in conjunction with a Folk Evening in the cafe which Alison had organised to raise funds for the new children’s playground, with music being provided by Fleetwood Folk Club. 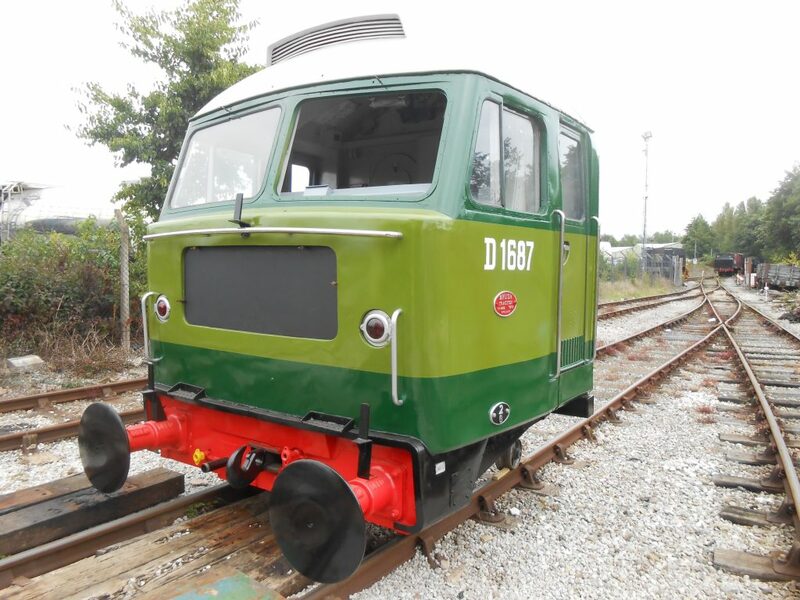 The whole event turned out to be a great success, so well done to Alison, to all those who provided the music, the front of house staff and, of course, the diesel gang who ran the trains. There is already talk of another similar event next year. Last Thursday afternoon Tim went across to Locomotion at Shildon on behalf of the FRT to attend a Stakeholder Reception to mark the takeover of Locomotion by the Science Museum Group (SMG). The museum had previously been run as a partnership between Durham County Council and the National Railway Museum. It was announced that Durham County Council is to fund the conservation of the Grade 1 listed coal drops, which have been fenced off because of a deterioration in their condition. Ian Blatchford, Director of the SMG, then confirmed that the SMG is going to spend £1.6m on conserving the historic buildings at the Hackworth end of the site and that he had aspirations to spend more money on telling the story of Shildon’s contribution to the early days of railway operation. It was all very uplifting! Next weekend sees Alan and Alison also head once again over the Pennines to Locomotion at Shildon for a couple more FR 20 steamings in connection with the Shildon Model Railway Exhibition. This last week brought the sad death of David Shepherd CBE. David was a man of passion, who made his name by bringing to life on canvas wild animals (particularly elephants) aeroplanes and steam locomotives. He befriended us many years ago through member Derek Milby and, as a result of this, famously gave a lecture at the Coronation Hall in Ulverston. His double-decker sales bus appeared in the Lakes on more than one occasion and he delighted in joining us for a musical evening on Roger Mallinson’s steam launch Shamrock on Windermere. We also made several exchange visits down to the East Somerset railway at Cranmore where some renowned and very liquid folk evenings were held in the village hall. An avowed conservationist of both wildlife and steam locomotives, the world will be very much the poorer for David’s passing. Last Tuesday evening saw a gathering at the Ashton Bowling Club for the Ribble Steam Railway AGM at which Tim, Alison and fellow FRT member David Starkie were elected as directors of the RSR. Tim then presented a photo presentation entitled “The Activities of the Furness Railway Trust”, which was followed by some slides of Steamport at Southport. An evening of some nostalgia for all! We were delighted to welcome new member John Davis at Preston on Wednesday – he must have enjoyed it as he turned up again with a new set of overalls on Friday. John is seen here by the RMB bar with Mike Rigg, who did the induction. It was again a time of finishing all the remaining snagging jobs in the RMB with John Dixon still working on restoring some of the wooden panelling by the doors, Paul replacing the servery area cupboard shelves, Mike starting to replace the ceiling fans and John Davis assisting with some of the other fittings. There was further work on Caliban, with Alan turning his attentions to the cab and Ade wielding a paintbrush on the running board. 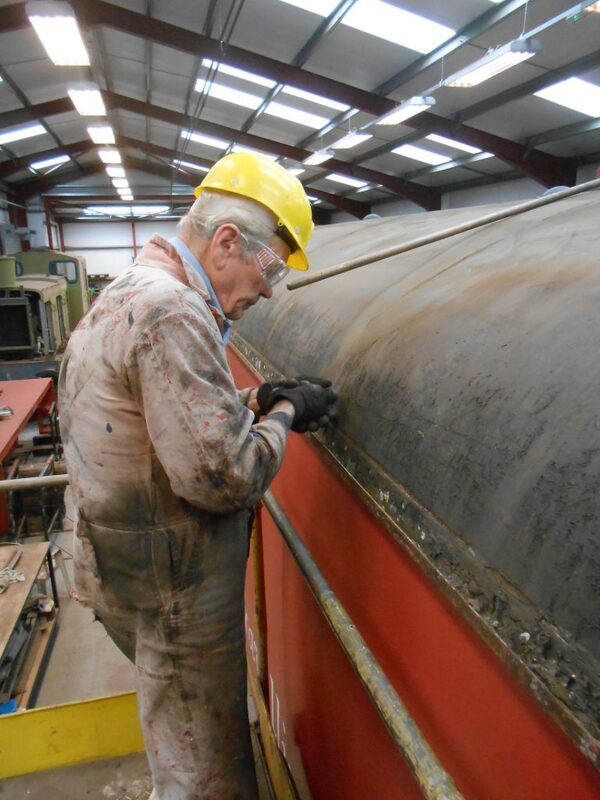 Bob appeared on Friday and spent some time taking a rubbing of the numbers stamped on Wootton Hall‘s tender frames which had been found after the shot blasting had taken place. 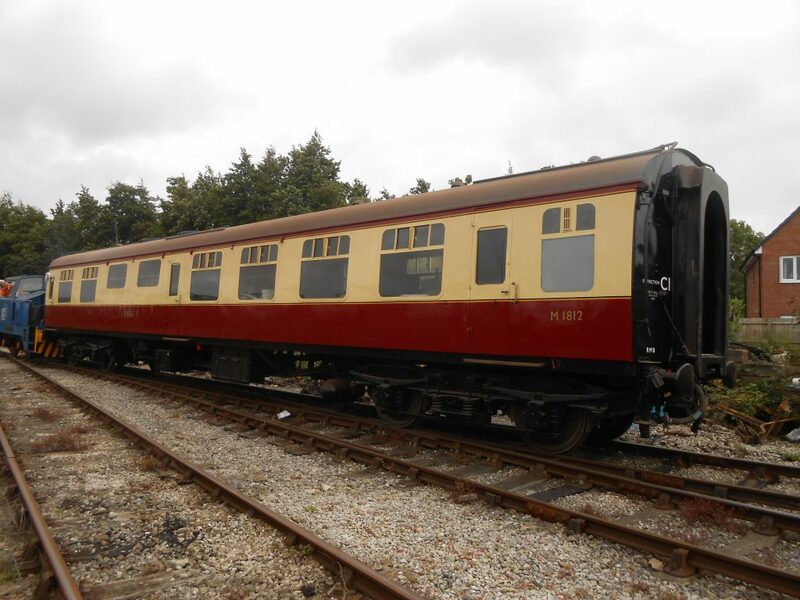 The exact number of the tender has always been a mystery and Bob will be making contact with a gentleman in Swindon who has been keeping tabs on this particular vehicle with a view to identifying it. 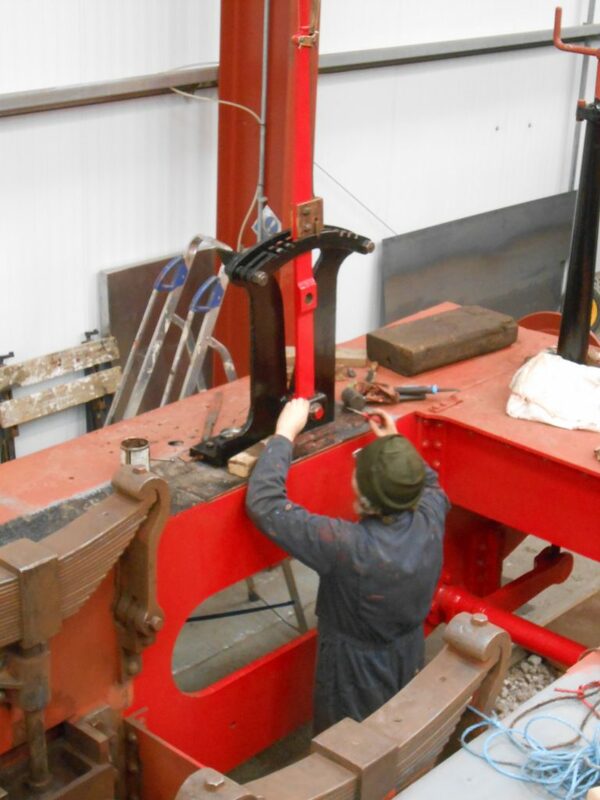 Keith was also present to make further progress on the loco. Alan and Alison went across to Locomotion at Shildon yet again, it being the annual Steam Punk weekend at which people delight in dressing up in all sorts of incredible garb. Steam Punk is defined as being retro-futuristic and FR 20 probably fits quite neatly into the scene, although we are not sure how you should view the two coach Pacer passing in the background! 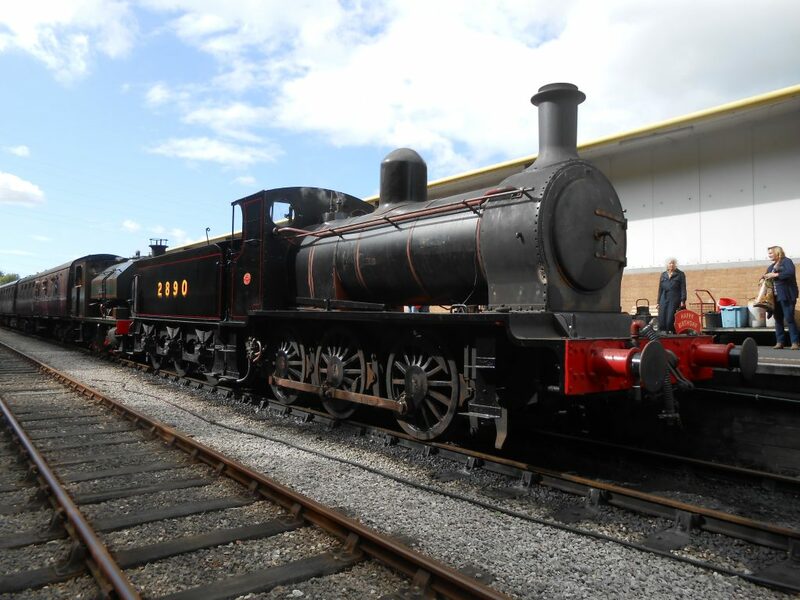 As many of you will be aware, the Trust’s GWR 0-6-2T No. 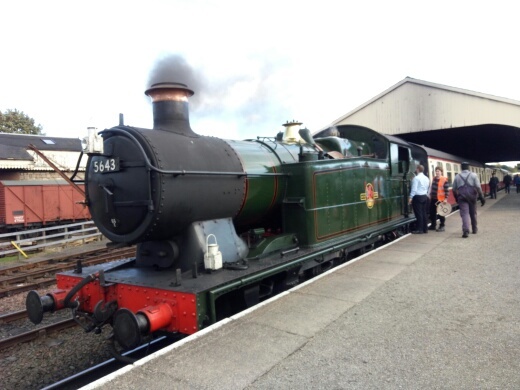 5643 is currently out of service for its 14 month boiler examination. In preparation for this, the brick arch has been removed and Andy Booth has put in twenty new patch screws. 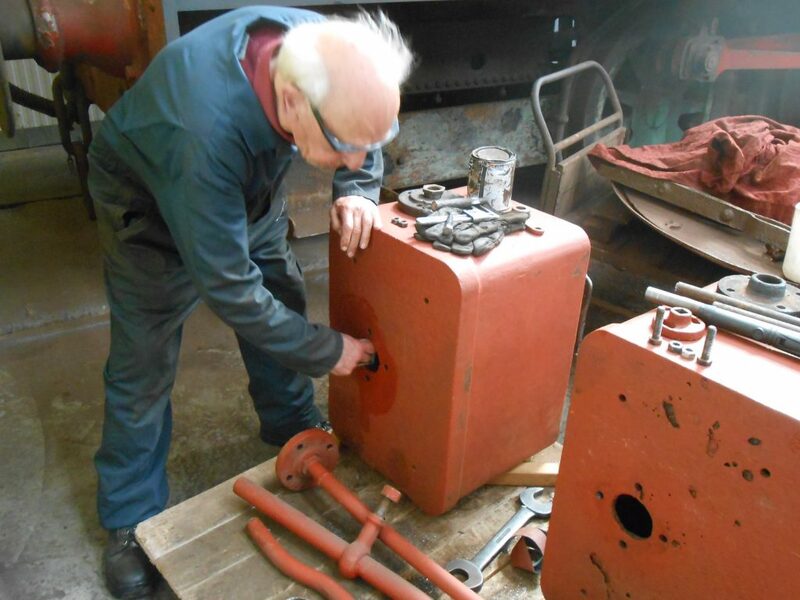 Keith and George were going over to Embsay yesterday, Sunday, to remove the remaining plugs and mudhole doors ready for a cold examination by the boiler surveyor, which we hope will take place this week. 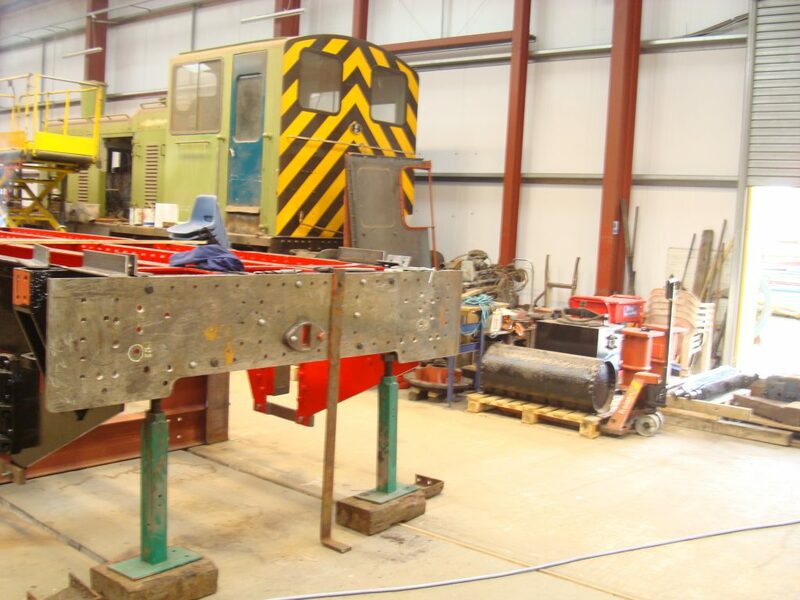 It is planned to fit the new blower ring, which is currently being machined by Steve Shearing at Preston, next weekend and then hold a formal steam test the following week. So, fingers crossed! Finally, it is reported by the latest Cumbrian Railways Association newsletter that the former Vickers Gun Range signal box, which was gifted to the Wensleydale Railway Association by the FRT a few years ago, will be moved from Scruton to Leyburn where it will be used to control the movement of trains following the planned installation of a passing loop there. As many of you will be aware, the signal box was originally preserved by FRT member Jon Wilkinson, who himself gifted the signal box to the FRT. Working parties at Preston last week were rather more thinly attended, but still the work went on. John has now nearly finished fitting trimmings around the doors of the RMB. 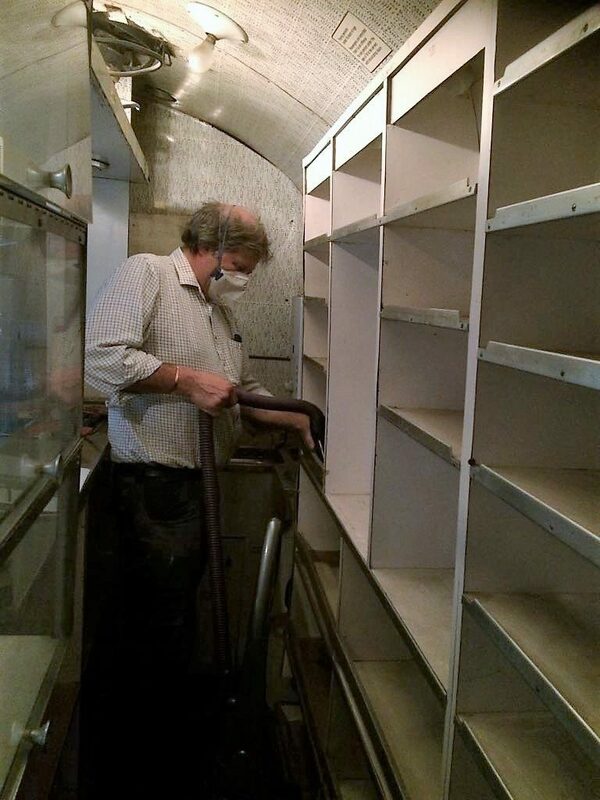 Mike has been busy cleaning the shelves behind the counter. Paul painted the remaining radiator guards (one of them new) which were then fitted along with the remaining tables. Mike then turned his attentions to vacuuming the seats. Work continued on Caliban and Fred did more cleaning up of the former Foxfield water column. 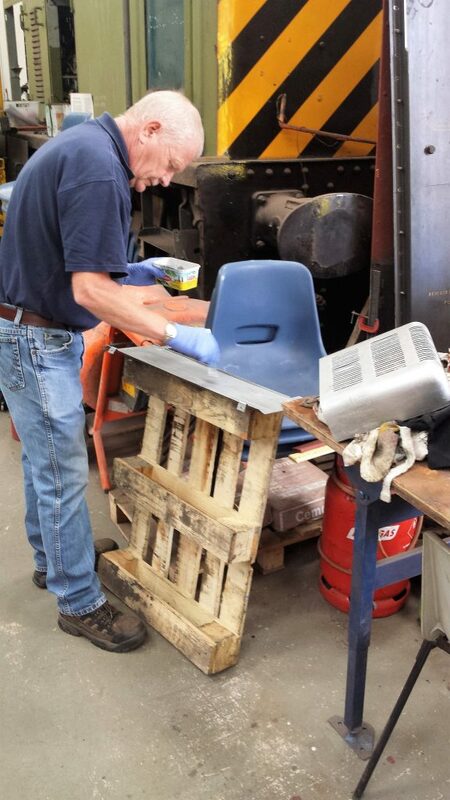 Keith has been cutting spare metal to make new support stands for Wootton Hall‘s tender frames. 2-6-0 No. 78018, the star of British Transport Films’ classic “Snowdrift at Bleath Gill”, was back on former home ground and on show in light steam along with Flying Scotsman, which arrived on Friday evening having hauled an excursion form London Victoria to York. It was a bit of a surprise to find long standing FRT member Jon Wilkinson in the cab, having volunteered to join the locomotive’s support crew during its operation at the West Somerset Railway earlier in the week. 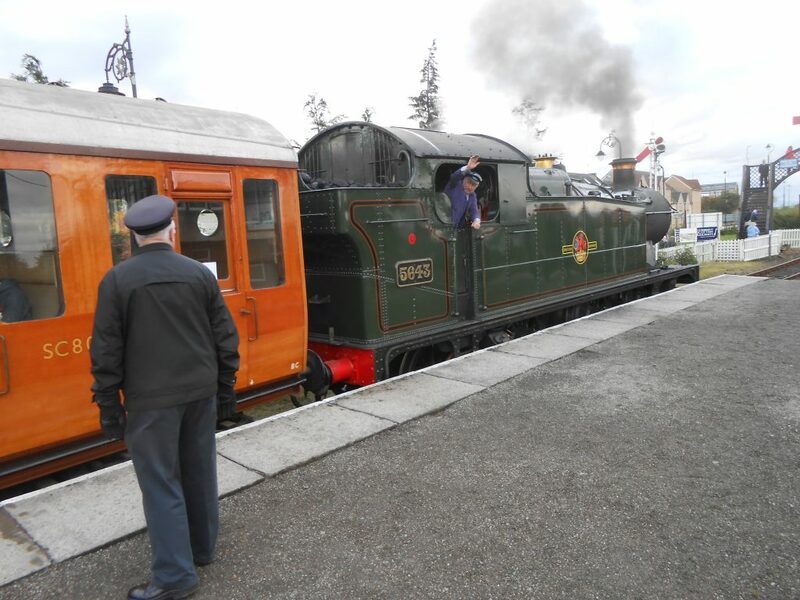 Saturday saw FR 20 work the demonstration line service until 2.15 pm after which there was time to top up with water and for Flying Scotsman to back on to the other end of the two brake van train. The giant 4-6-2 and rather smaller 0-4-0 then hauled the demonstration train up and down from 3 pm until 5.45. It was then time to head off to the local hostelry for food, accompanied by the four strong Flying Scotsman support crew before retiring for an early night. Alan, Alison and Tim were, not surprisingly, pretty tired after the day’s activities. Peter and Dickon joined the fray on Sunday morning, helping to clean FR 20 after the night’s rain and the loco once again operated the demonstration line service until 1 pm and then topping and tailing with Flying Scotsman from 2 pm until close of play. Heavy rain showers brought the unusual sight of the FR 20 crew soldiering on in the rain under the conveniently borrowed NRM umbrellas – it looked like something from a Roland Emmett sketch. The relationship formed with the FS crew the previous evening enabled Alan and Tim to enjoy some cab swapping later on Sunday, ending a most enjoyable weekend during which hundreds of passengers were carried. 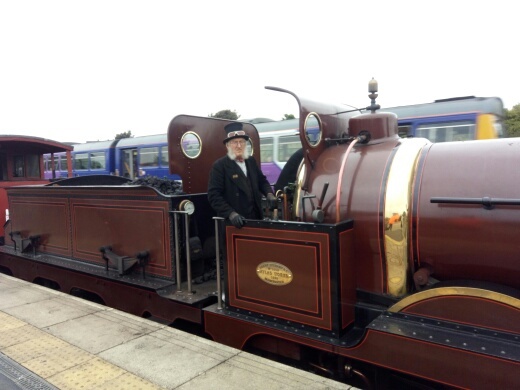 Alan and Alison are heading off to Shildon again next weekend for Locomotion’s now very popular annual Steampunk event. 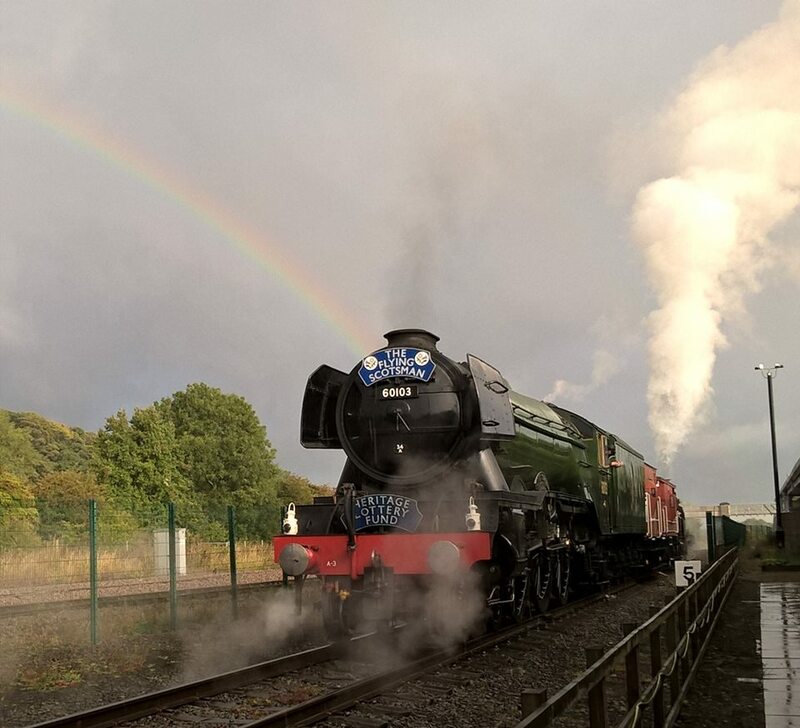 We leave you this week with a photo unashamedly shared from the Locomotion Facebook page showing a little old Furness Engine in the distance, formerly of a school playground in Barrow, hauling the mighty Flying Scotsman and train under a dramatic rainbow. Yes, dreams really can come true! 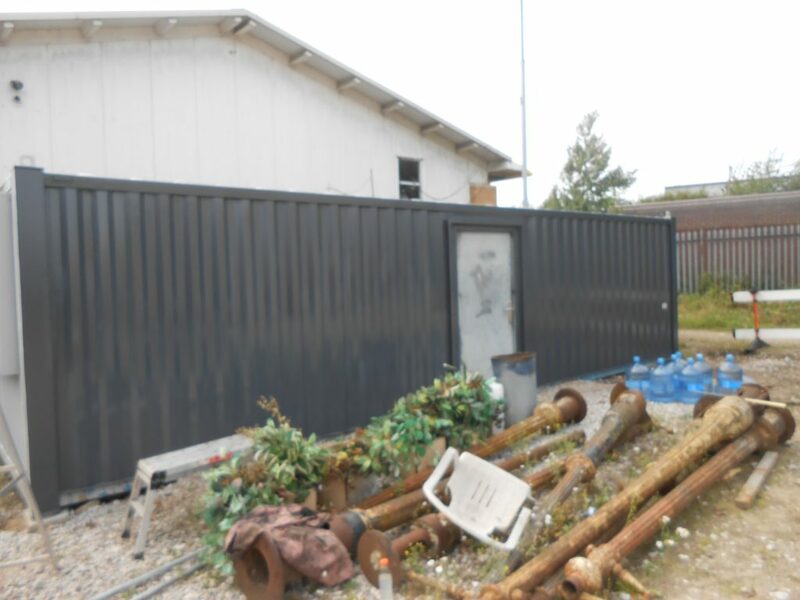 Any planning of work for last Wednesday’s working party at Preston went out of the window when we learnt that morning that it was proposed to have a shunt of vehicles in the shed. 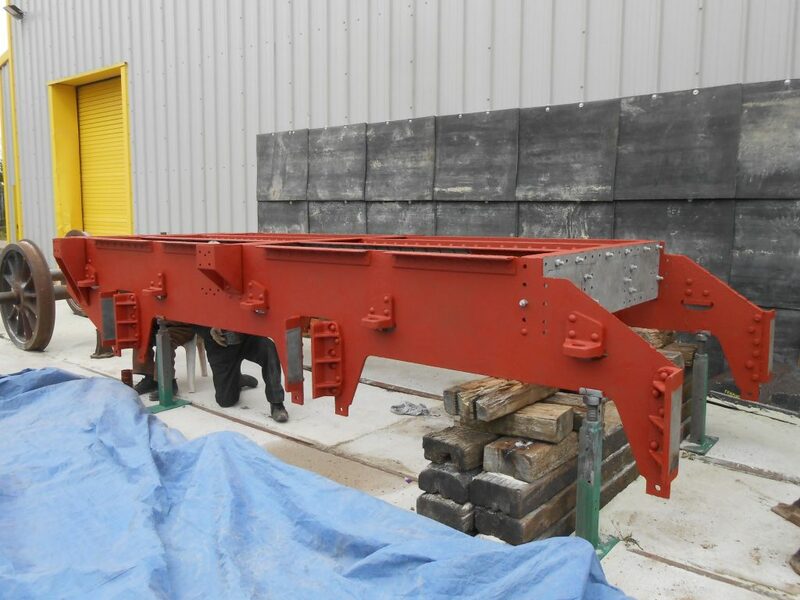 It had previously been agreed that Caliban‘s frames would be moved on to road two and that the newly shot blasted and painted tender frames for Wootton Hall would be moved behind the RMB buffet coach on road three. And so it all came about along with the movement of Peckett 0-4-0ST John Blenkinsop into the paint shop from road two, to be replaced by Hunslet 0-6-0ST Kingsley. 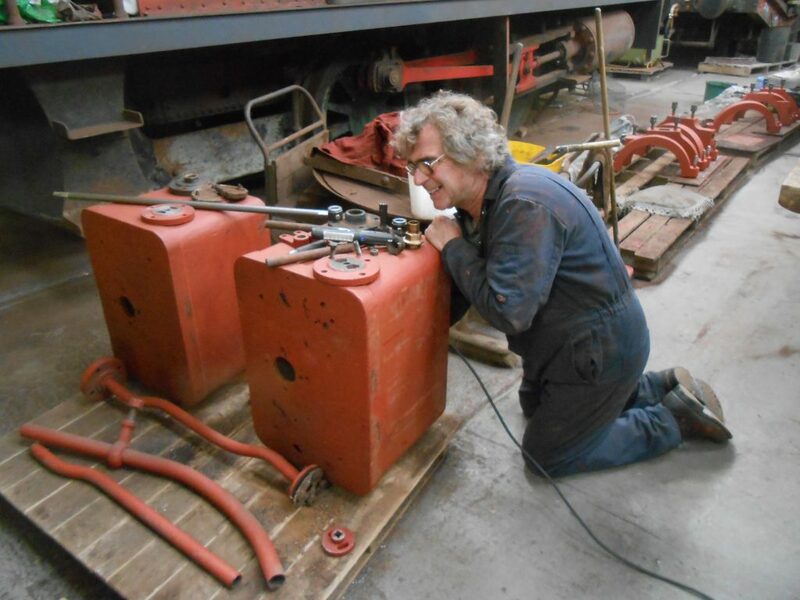 Needless to say, work had to start quickly on preparing Caliban‘s frames, including oiling the axleboxes which John is seen here undertaking along with a photo of it in its new position. 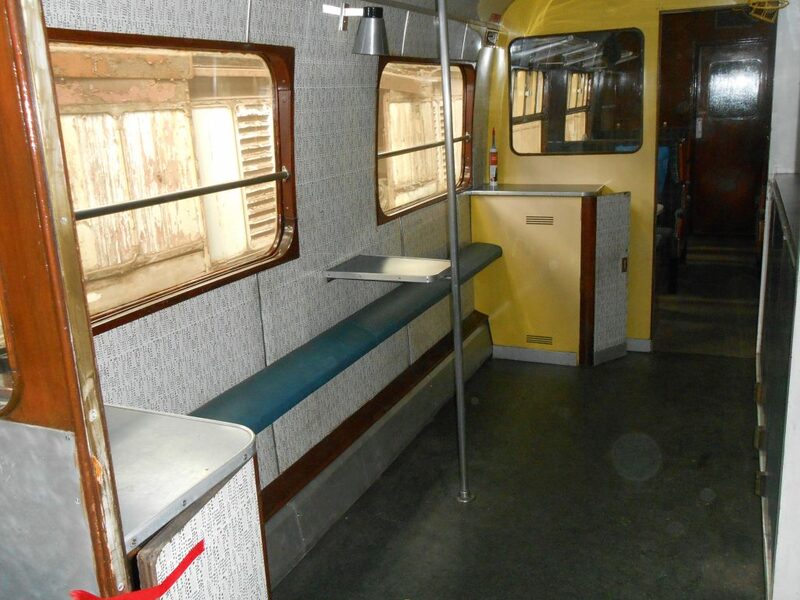 This was a chance to photograph the repainted buffet car out in the open and also the Class 47 cab which Dave and Jo have been preparing for the museum. It was also possible to photograph Wootton Hall without the RMB in front of it. 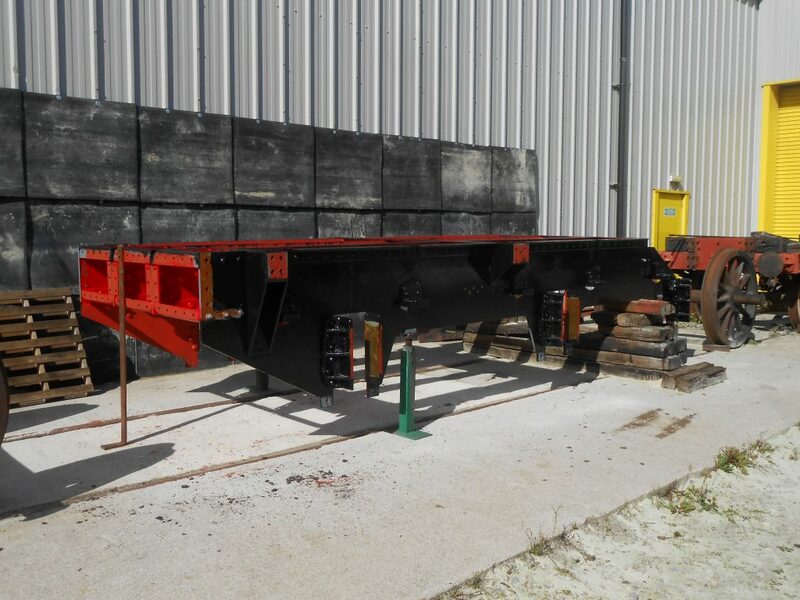 The tender frames are seen here in their new position in the shed. Well done to Ribble Rail’s Phil and Mike for getting the shunt carried out in a day. Friday was then spent removing the accommodation bogies from under the tender frames, giving the shed floor a good clean and setting up a display of FRT work and sales tables before the sheds doors were opened officially to the public for the first time for the Heritage Open Days on Saturday and Sunday. 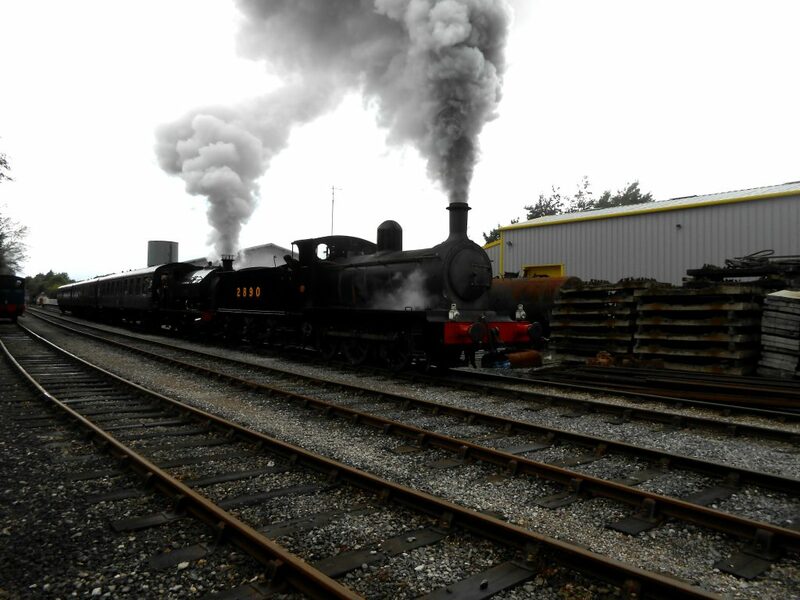 There was a constant flow of visitors to the shed, with a mix of enthusiasts attending the RSR’s Autumn Steam Gala and other members of the public following the Heritage Open Days trail around Preston. Around three hundred people visited the shed and Alison recruited four new members as well as making many sales. The Saturday was also a milestone event for the restoration of Andy Booth’s converted Hunslet ‘Austerity’ 0-6-0 No. 2890, which made its passenger hauling debut at Preston on the 14.45 train. Considering that the boiler had only been placed in the frames in the last ten days, this was quite an achievement and a great birthday present for its owner. Last week was the last of the summer holidays for many with children, but that didn’t stop some of the older generation from taking a break as well. So we were without Alan, Adrian and Keith last Wednesday, but this did not stop progress being made in various directions. 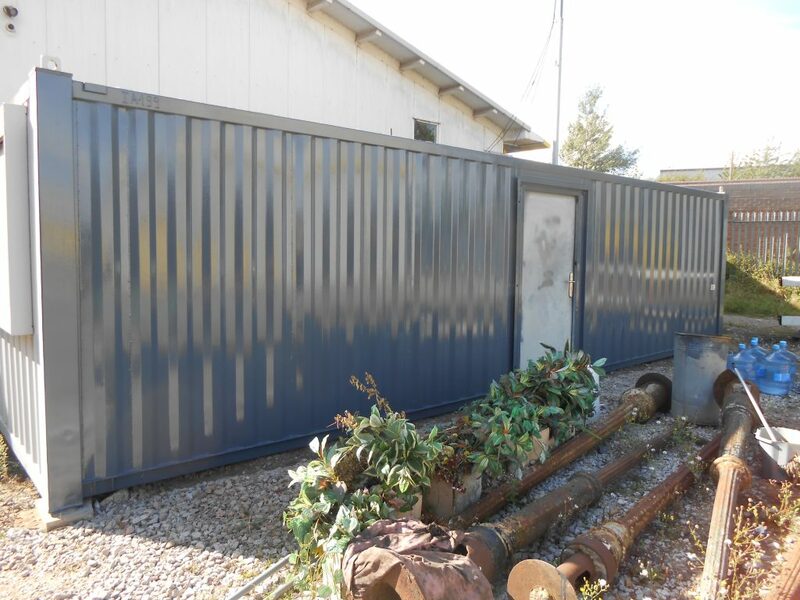 With the weather looking reasonable last Wednesday, John and Tim applied a gloss coat of paint to the side of the new mess room that will be up against the shed wall when it is moved, hopefully some time in September. For those worried about painting the door, it swings inwards and so can be painted at any time! 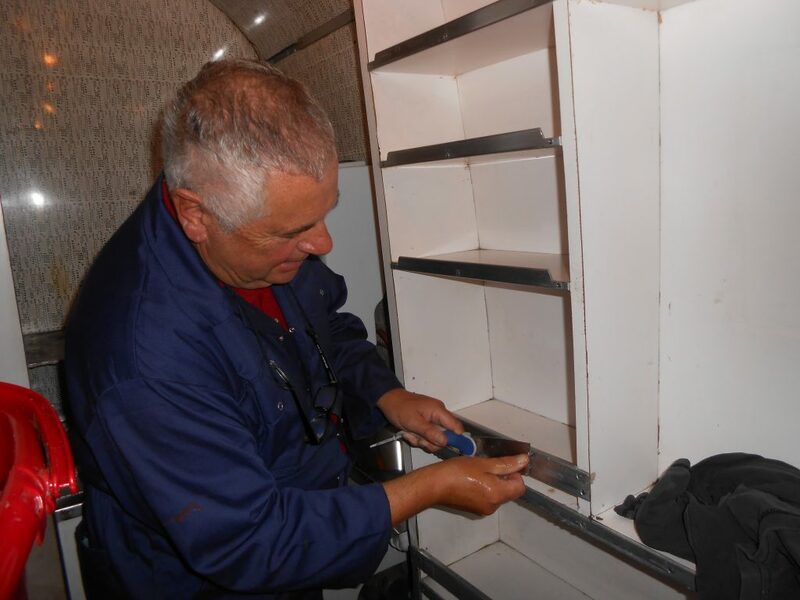 Mike and Paul have continued work on the interior of the RMB with the servery heater guards being fitted and a new heater guard for one of the saloons being finished off and painted. John has been replacing some of the architraves around the doors where they have been damaged during the welding repairs. 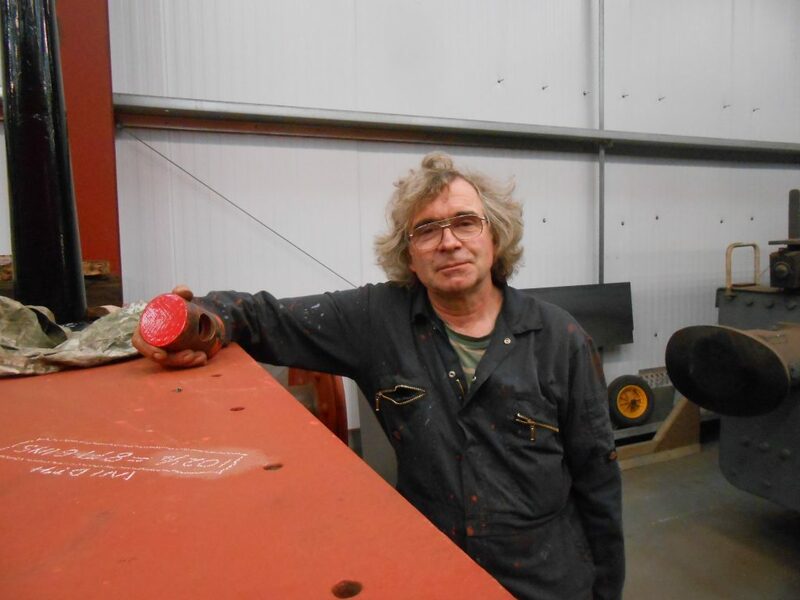 Despite the absence of other members of the team, Howard has continued his efforts to repair Caliban‘s sanding gear and can be seen here with one of the sand boxes. 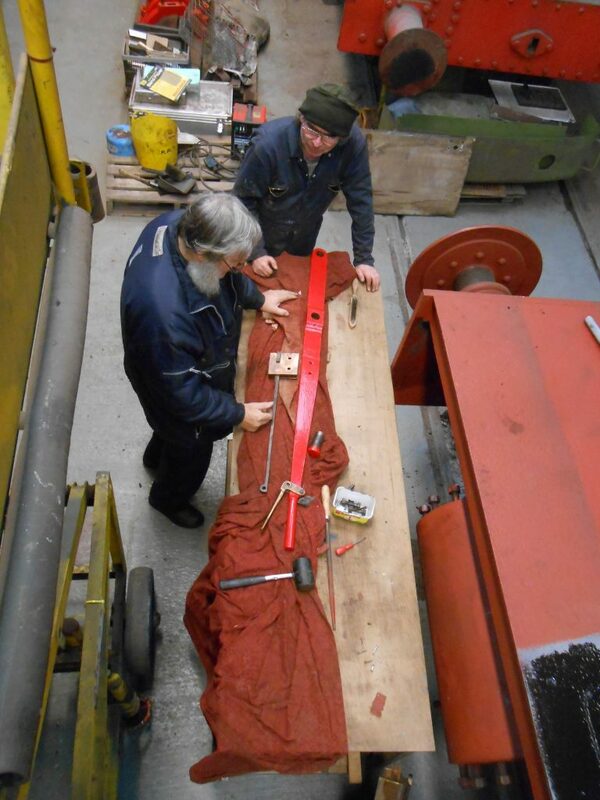 Fred and Roger have continued their task of painting Wootton Hall‘s tender frames, which are now beginning to look very smart, and Keith also appeared on Friday to carry on his work on the running plate. 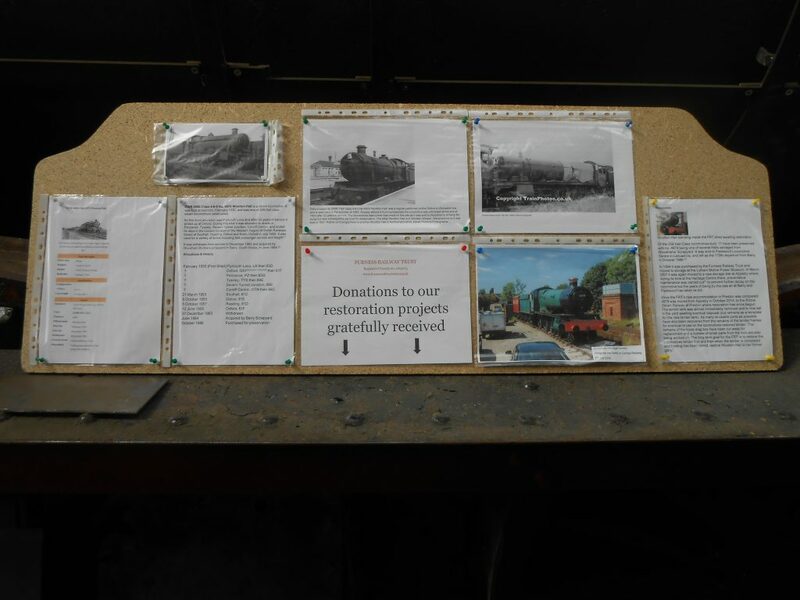 David has made up a presentation board recording Wootton Hall‘s history in readiness for the opening up of the shed for the Heritage Open Days this next weekend. John is seen here making it some legs. Do come along this weekend to see progress. 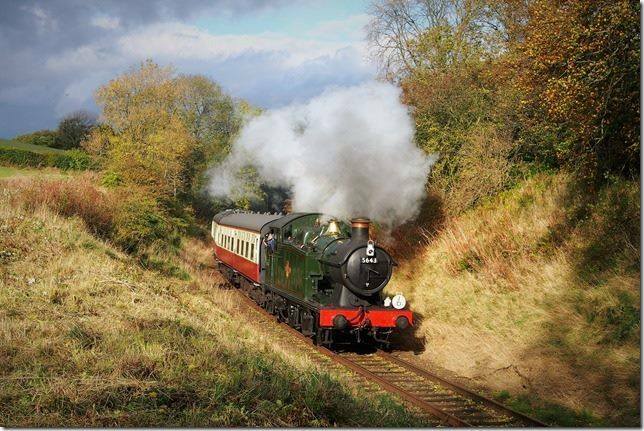 And don’t forget, it is also the Ribble Steam Railway’s Autumn Steam Gala. Alan, John H and Adrian appeared again last Wednesday to continue their good works on Caliban. 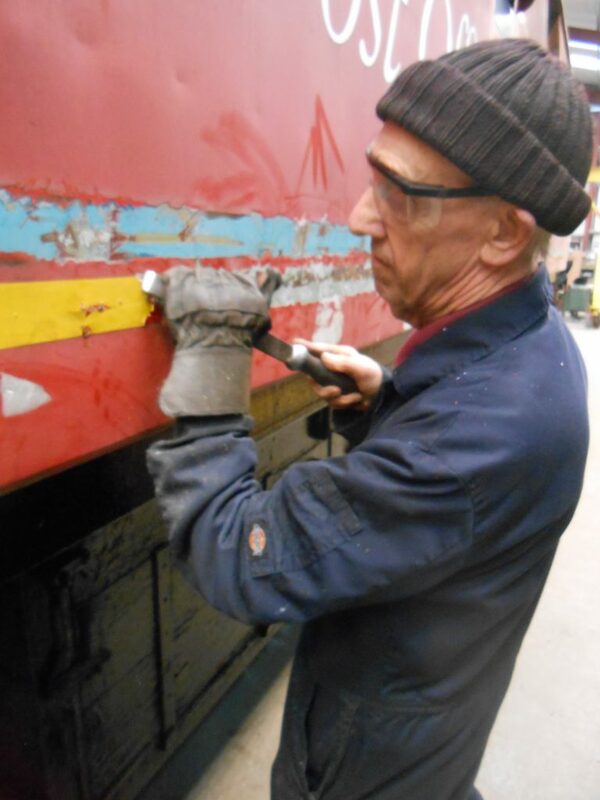 Alan spent some time attending to the rusted areas on Caliban‘s cab. John D started to compile his snagging list for the interior of the RMB and searched for various missing bits of wood to complete repairs. 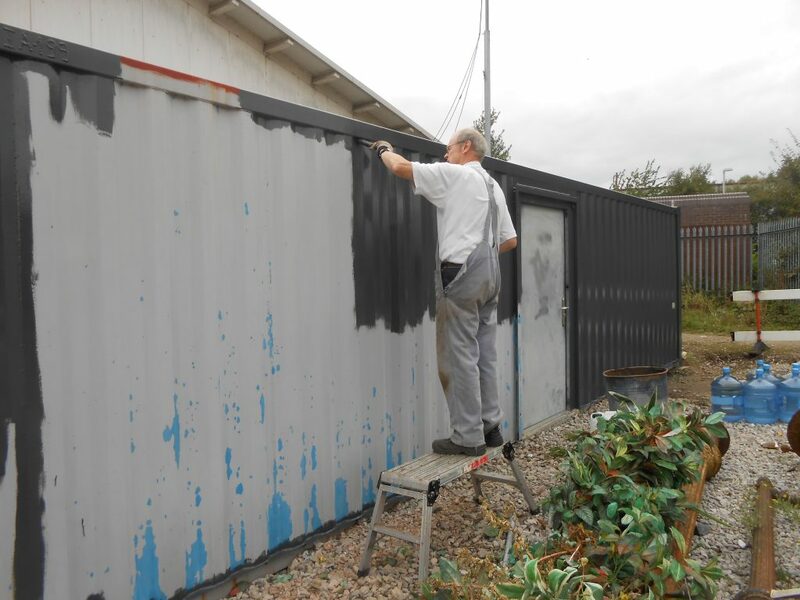 He then joined Tim on Friday to complete the rub down on the east facing wall of the new cabin and to apply a layer of dark grey undercoat. It is hoped to be able to put on the top coat this next Wednesday, which should match the RMB’s roof colour. David came in on Saturday to clear away the stones and earth from around the bottom of the cabin to allow access. 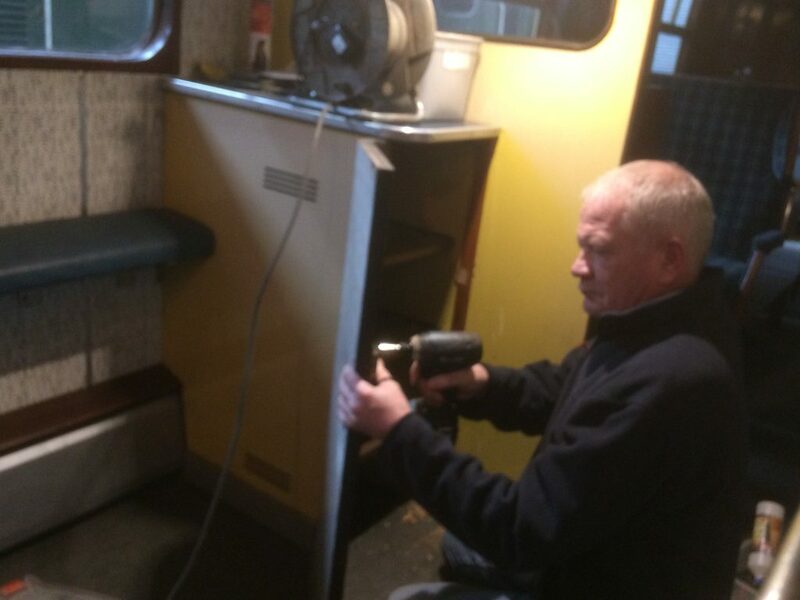 Mike and Paul fitted extracted some stubborn broken screws from the servery area foot rest and then fitted it along with the table. It’s all beginning to look very smart. 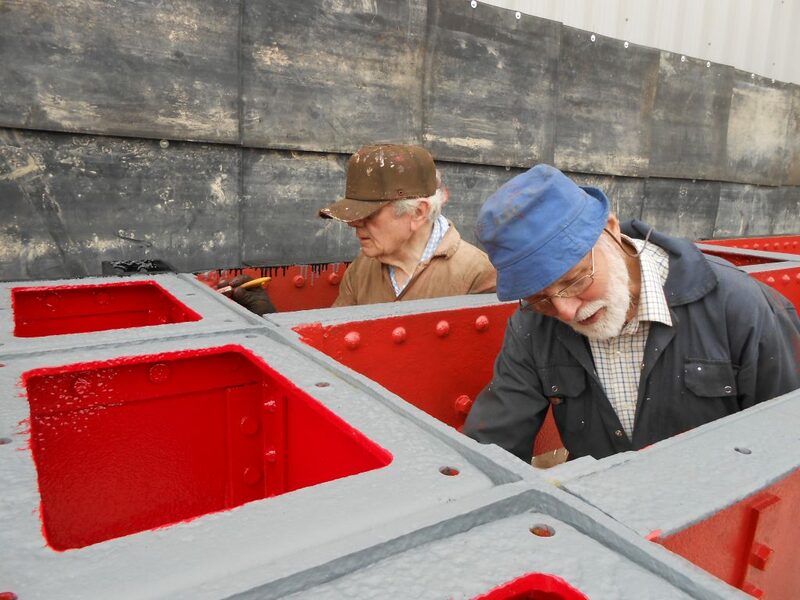 Fred and Roger have been hard at it with paint brushes again on the tender frames. Keith, meanwhile has been drilling more holes in the new running plate for Wootton Hall. 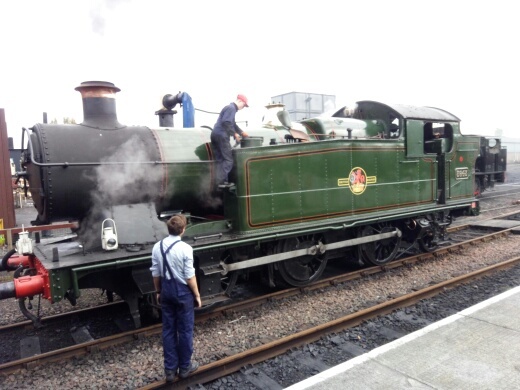 The 14 month boiler certificate for 5643 has now expired so Keith is looking to form a working party for next weekend to start on the necessary work to enable it to gain a new certificate. Please let Keith know if you are available to lend a hand. Andrew Furness and Derek Milby visited Preston last Saturday and Andrew donated a new petrol driven pressure washer that should be very useful. Finally, Alan and Alison have gone off on a short break to Cromer and called in at Shackerstone on Sunday for a ride behind Cumbria. 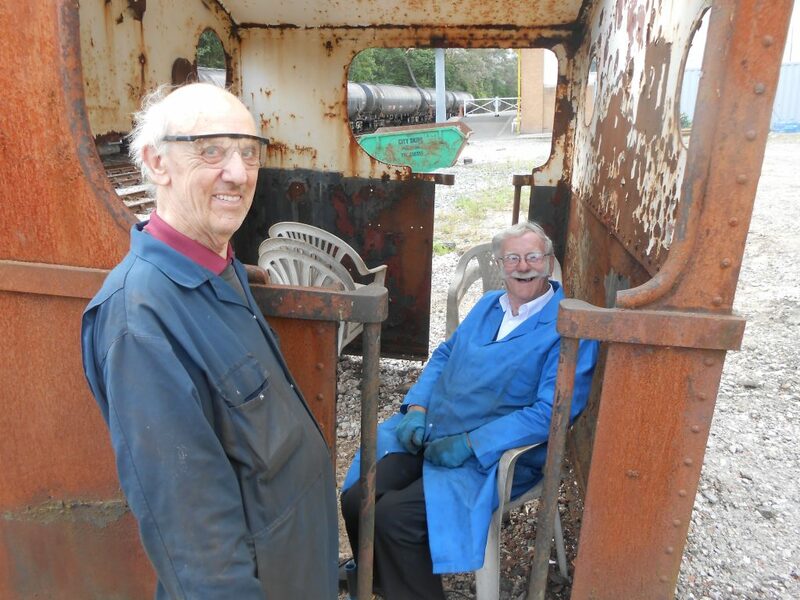 They also visited Rocks by Rail for a ride in the FRT’s LMS brake van. Another inter-holiday news burst for you before things get back to normal…! We are sorry to have to start by recording the passing of Jim Jackson (“Captain Birdseye” to some), former skipper of the MV Teal on Windermere who died at St Mary’s Hospice, Ulverston, on the 27th July at the age of 88. Jim served on the Windermere steamers for 42 years, following his father, also Jim, into the business. Those crewing trains on the L&HR could always expect a wave from the bridge from Jim followed, perhaps, by a pithy comment which kept you on your toes. Jim married Pam, who worked on the admin side of the steamer operation, and they lived at Railway Cottages, Newby Bridge, Jim’s home since the age of four. Our thoughts are with Pam and family at this sad time. 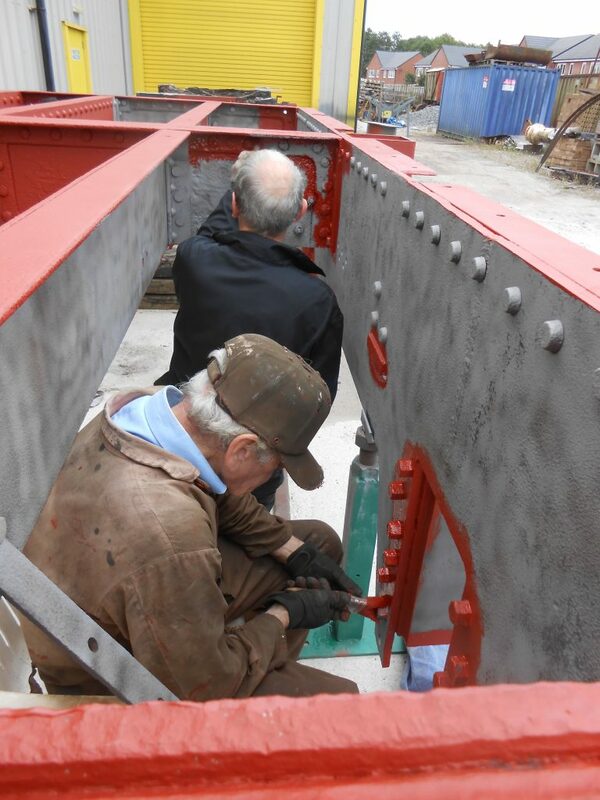 There has again been more progress at Preston, the highlight being the shot blasting of the tender frames, which have now also been primed, with most available working members lending a hand with the paint brush. The frames are now in the process of receiving undercoat paint. 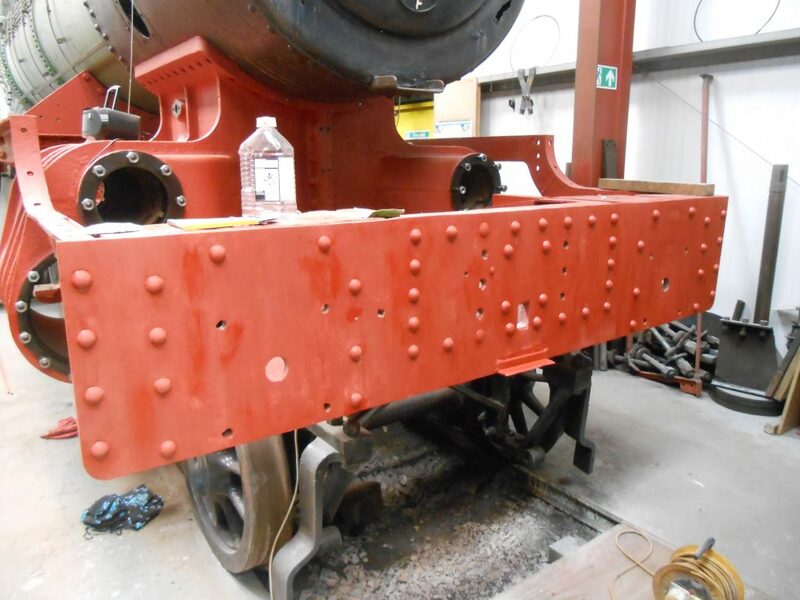 Work has also continued on Wootton Hall‘s engine, with more of the replacement metal for the running board being cut and the buffer beam being filled, sanded and primed; the latter will enable the buffers to be bolted on again. And Matt has been busy making new nuts for the cylinder and valve studs. The RMB, lino laying now completed, has received further attention from Mike and Paul who have re-installed the buffet sliding door and the cupboards and “bum rest” in the servery area. 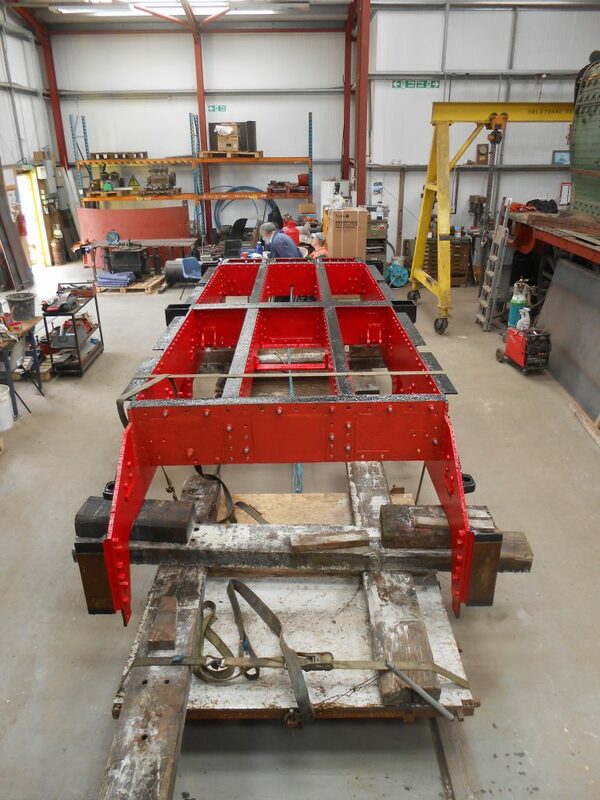 There has been more attention given to Caliban, with Adrian working on the frames and sand boxes, John H in the cab, and Howard on the sanding gear. 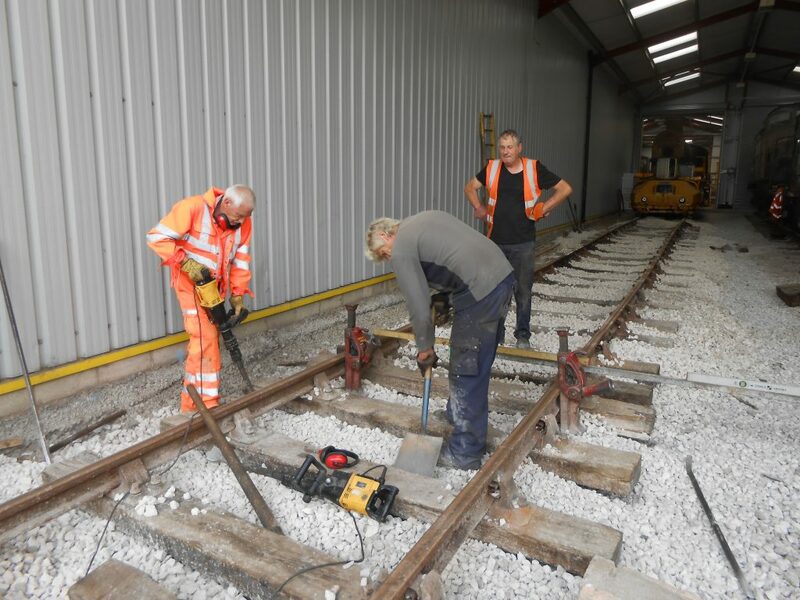 More progress has also been made with levelling the track on road three of the unheated portion of the shed, with Ed, Phil and Keith seen here. Finally, Alan and Tim were at Shildon on Friday for a training session on the new rule book and newly issued procedures. There then followed a further practical assessment on FR 20. 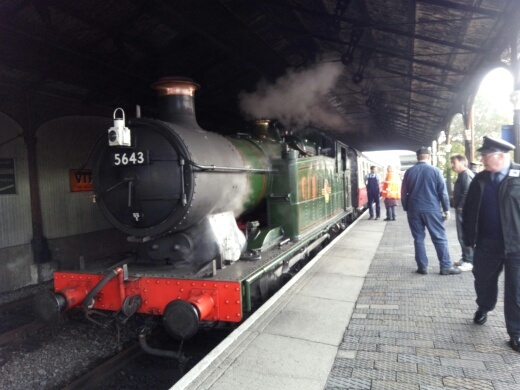 The locomotive was again used on Saturday for more crew assessments as well as for operating a passenger service.